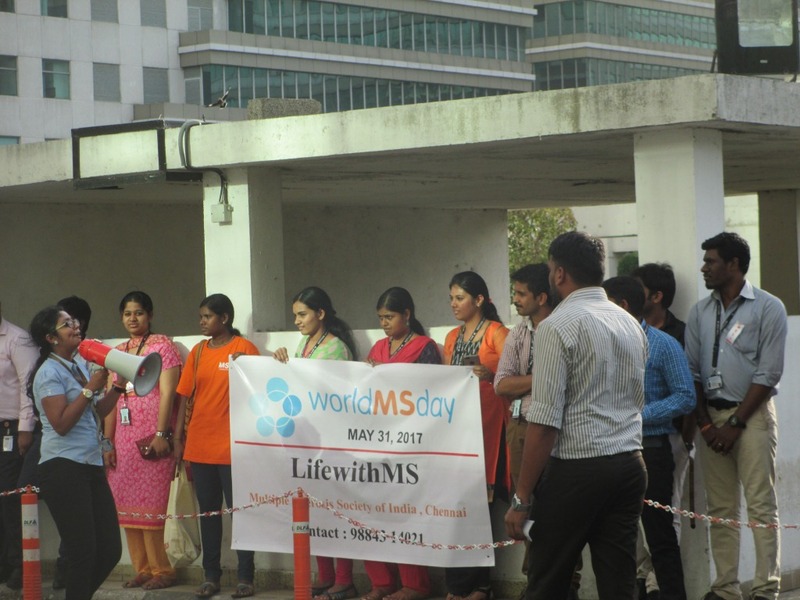 To commemorate World MS Day Flash Mob was organized at Orion Mall, Rajajinagar, Bengaluru on 28th May 2017. 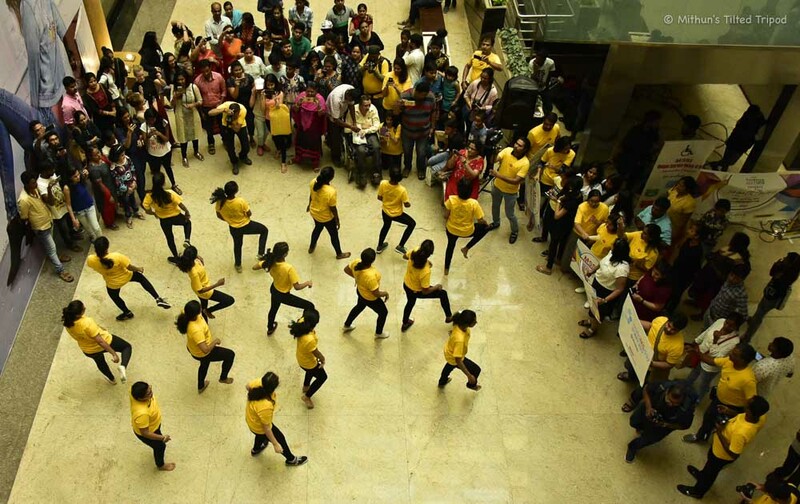 We had participants from Mount Carmel College students for the Flash Mob. 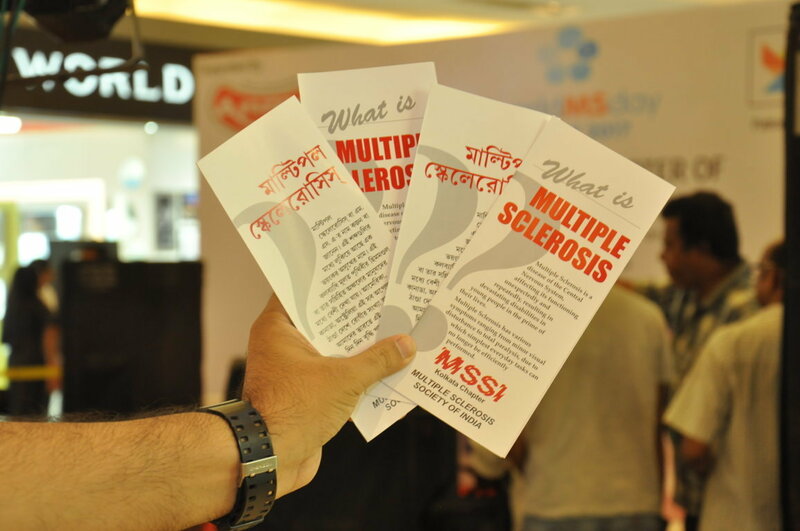 This was indeed a great opportunity to create awareness among the public present there in the mall about MS. Pamphlets were distributed to the public present there. There were also MS persons present in the gathering. As 28th was happened to be one of our MS person Geetha’s birthday the whole team celebrated it in a great way. 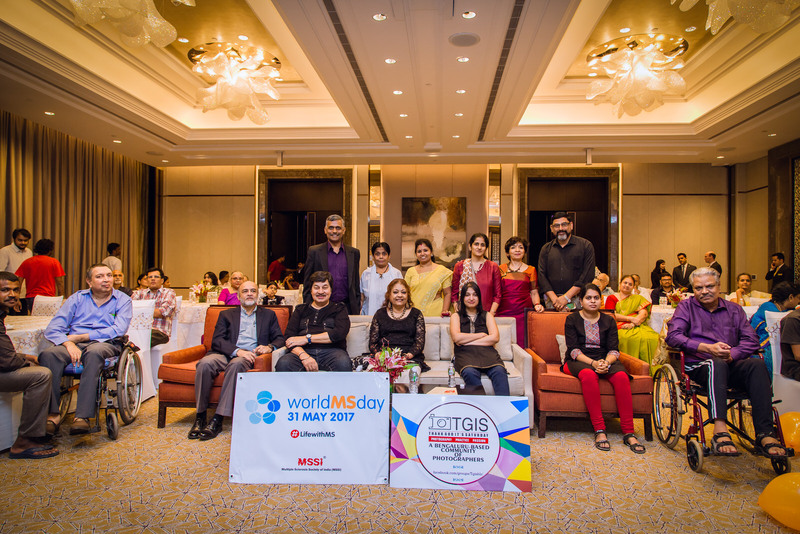 On the occasion of World MS Day an exclusive preview of the photographs from Jagachitra Exhibition was organized at Hotel Shangri La. 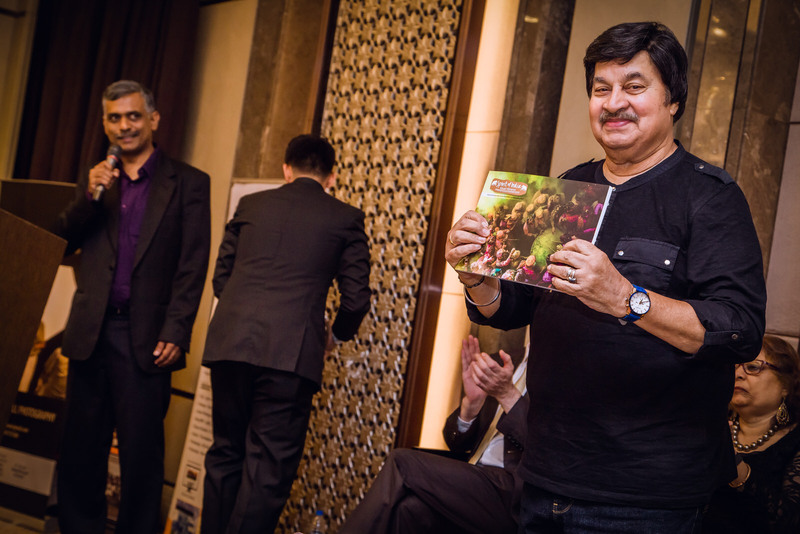 Renowned Kannada Actor Mr. Srinath was The Chief guest & the Guests of Honour were Mr. Anand Sharan, Director of Anand Sharan Photo workshop & Mr. Andreas Streiber, General Manager, Shangri La Hotel, Bengaluru. 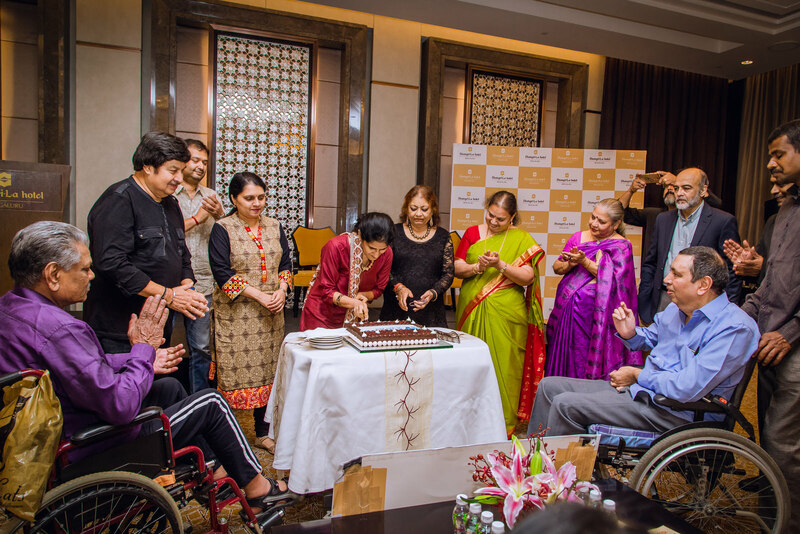 Twelve MS persons along with their caretakers, Corporate people & photographers were present For this awesome evening celebration. 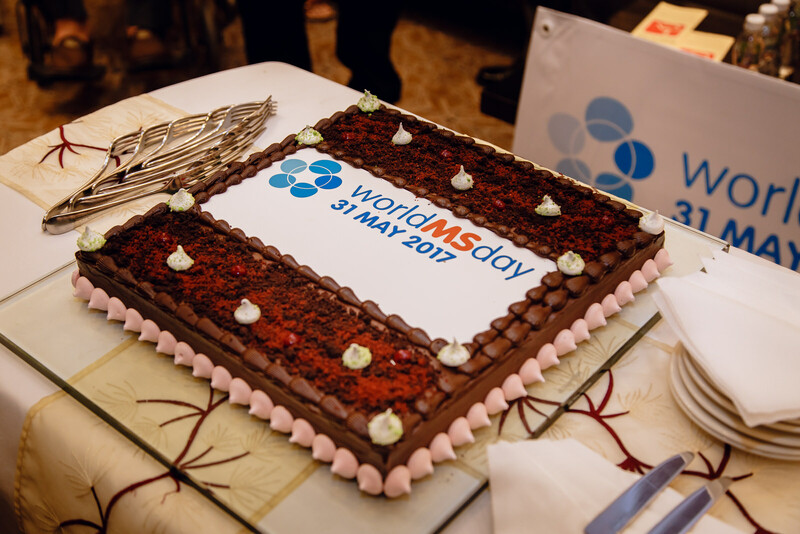 The program started with the cake cutting by the MS persons for the World MS Day Celebration. Mr. Shankar welcomed the Chief Guests & other dignitaries present. After the welcome speech Launch of Coffee table book which was part of the WMSD celebration & Fund raising was inaugurated by the Chief Guest Mr. Srinath. 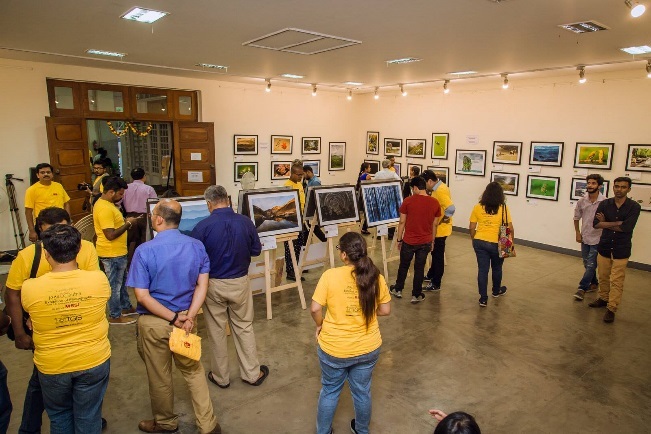 Fund Raising Program: Photography exhibition was held to raise funds for the society. 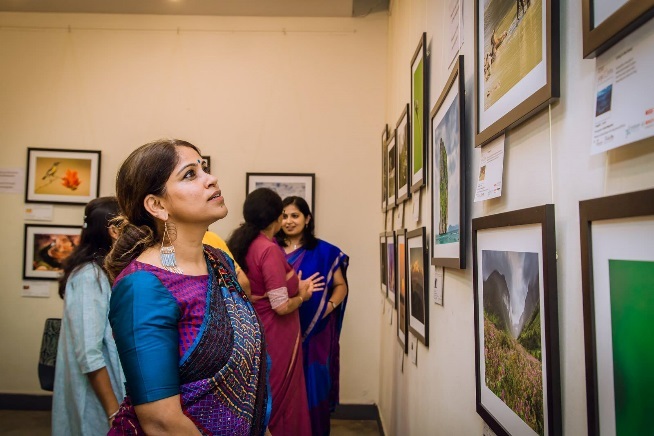 This exhibition was a collection of exclusive photographs named “Jagachitra” a creative collaboration by the photographers of TGiS (Thank God it’s Saturday) community. 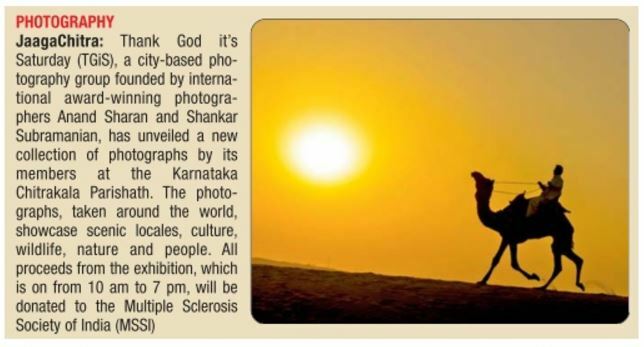 Total 117 photographs were displayed in the Exhibition for sale consisting of portraits, wild life, bird photography, macro photography & Culture etc., We had more than 3000 visitors over 5 days and had opportunity to spread awareness though this as well as coverage in various news papers. Chief Guest present for the inauguration were Ms. Sudha Belawadi , a popular actress and Ms.Vasanthi Hariprakash a popular media person. 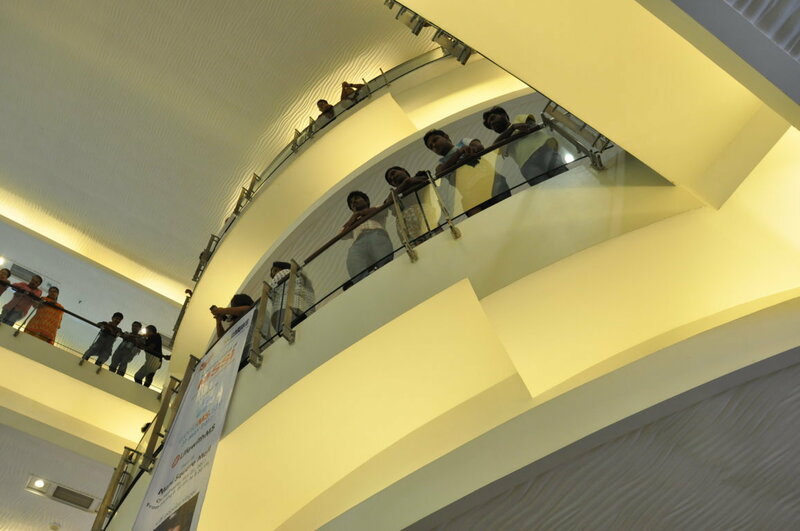 May 26, 2017, saw the Express Avenue Mall, Chennai’s biggest shopping Mall, reverberate the sounds of drums, music, song, dance and drama for a good 3 hours. Footfalls of all ages were more than 3000, that evening as a theatre complex with 6 theatres overlooks, the Atrium of the Mall. 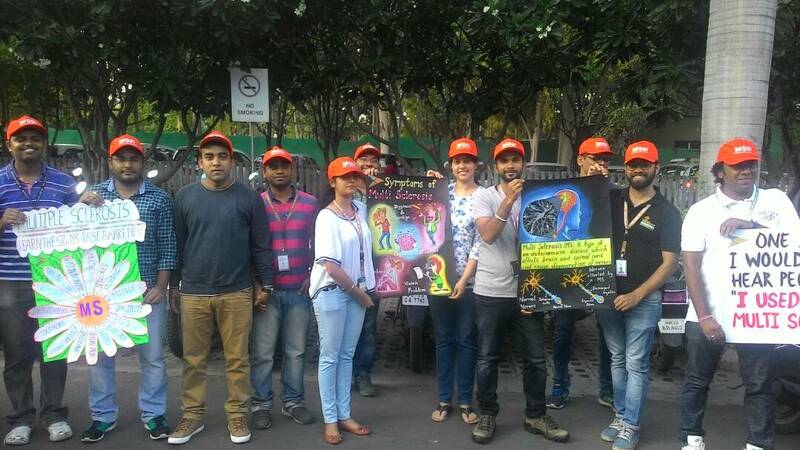 The theme “Life with MS” and creating awareness was brought about by two dramas – one a Koothupatharai – village play in Tamil, and a second was a Meme in English by BNY Mellon employees, our CSR partners. 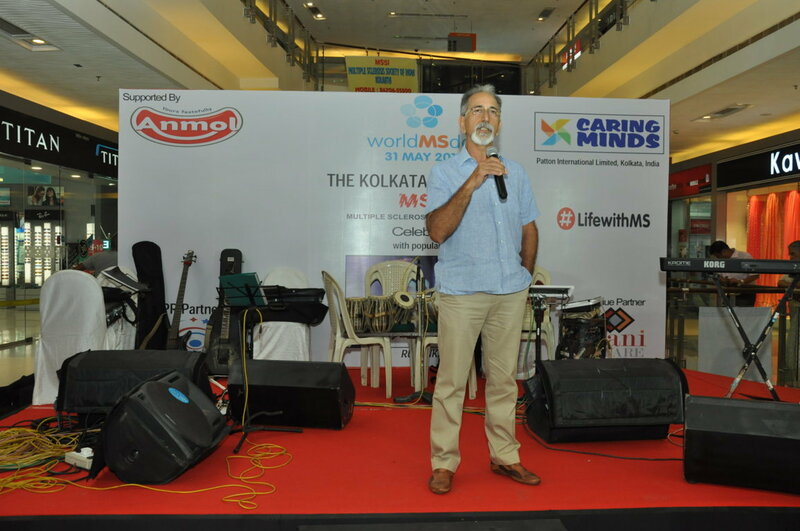 The entire evening reverberated with questions, what is MS? How do you get it? What is the cure etc? , as Volunteers distributed Orange Ribbon and leaflets on MS. Most visitors expressed the view that they had not heard the word/ disease – Multiple Sclerosis, before. 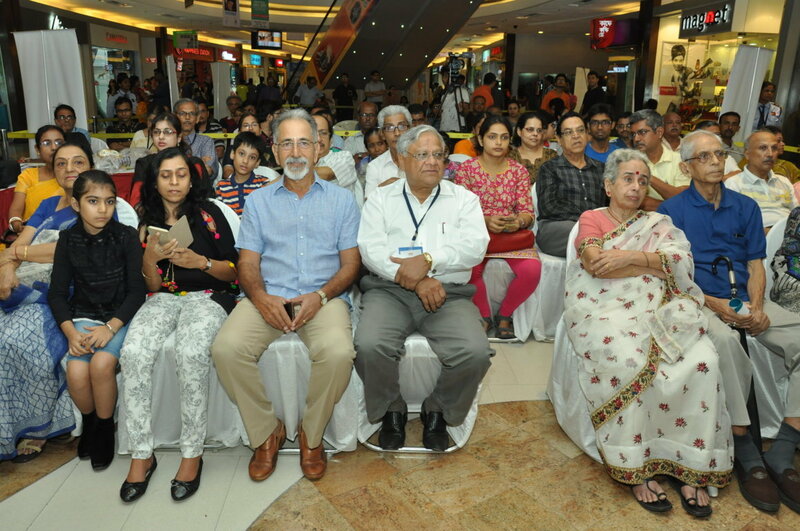 It was a great evening of creating Awareness about MS, more so because it was well attended by MS persons in Orange T Shirts with their families. Both the skit and Meme was to make people to understand MS and its symptoms. 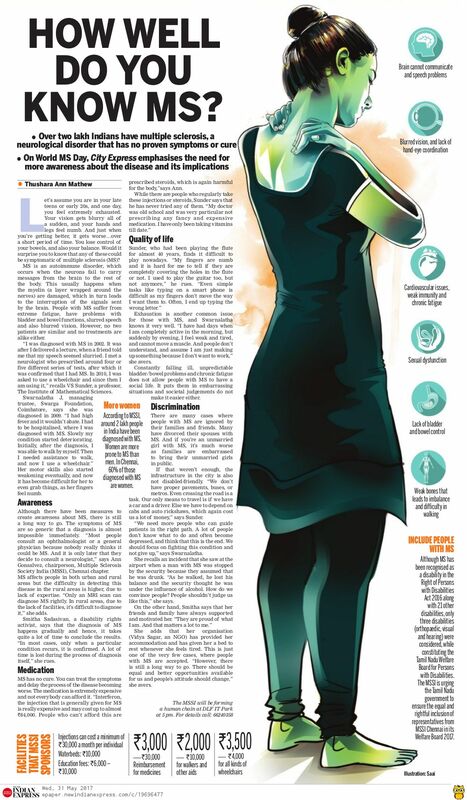 It definitely helped to educate people about MS, early diagnosis and how proper doctor consultation is important in MS. They enacted and conveyed the essence of the day in a simple way. There were interludes of cultural items by “Rhythm of Life” group. People were entertained with songs, dance and mimicries, etc. 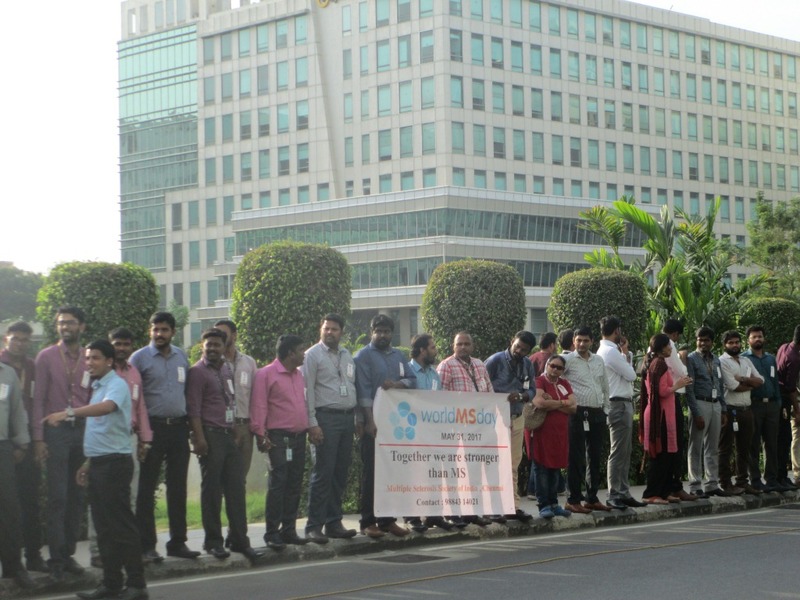 BNY Mellon, are our CSR partners with their employees, more than 800 of them , together with our members joined hands to form a human chain on evening of 31.05.2017, at DLF IT Park which houses about 20 IT companies. The slogan “We’re stronger than MS” and “Life with MS” rent in the air. 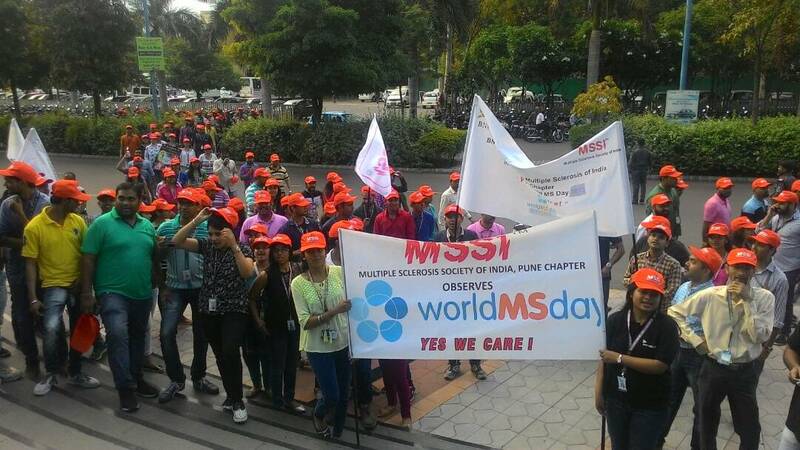 We all stood together to show solidarity with the rest of the World to mark “MS Day”. The Human Chain grasped the attention of all the employees in the huge 65 acre campus. 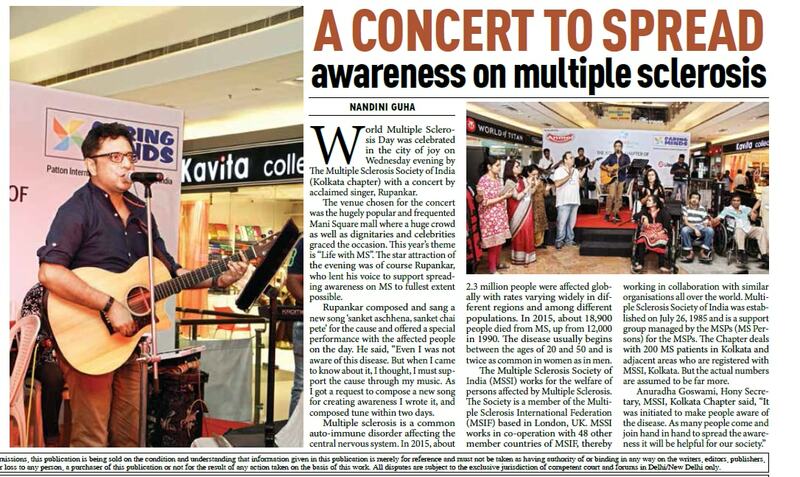 It was really an “Awareness Campaign about MS”. Lighting up of Buildings in Orange. 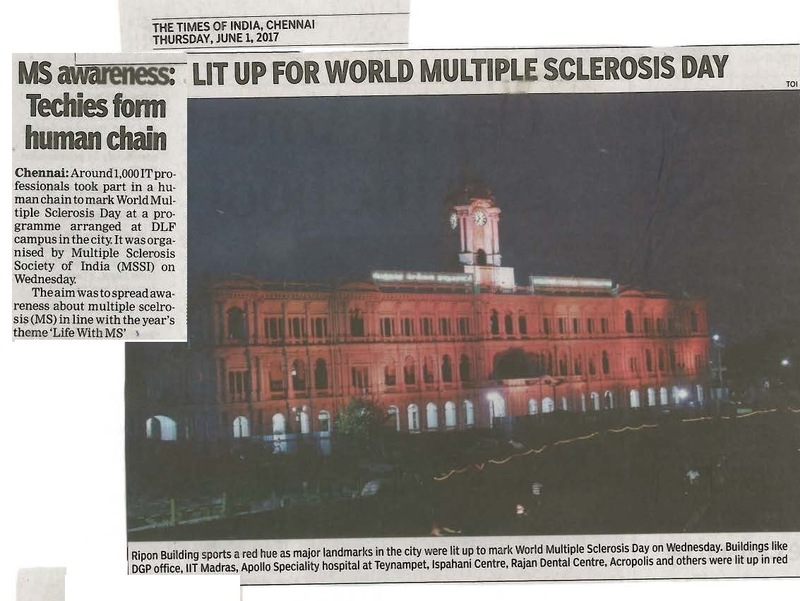 On the evening of 31.05.2017 – Prominent buildings were lit in Orange like Corporation of Chennai (Ripon building) Apollo Speciality Hospitals, Ragas Rajan Dental, Acropolis building, Fagun Mansion, IIT Madras, TNPL building, Bergamo, Director General of Police, Chennai, Building housing Commission for the Differently Abled, to name a few. 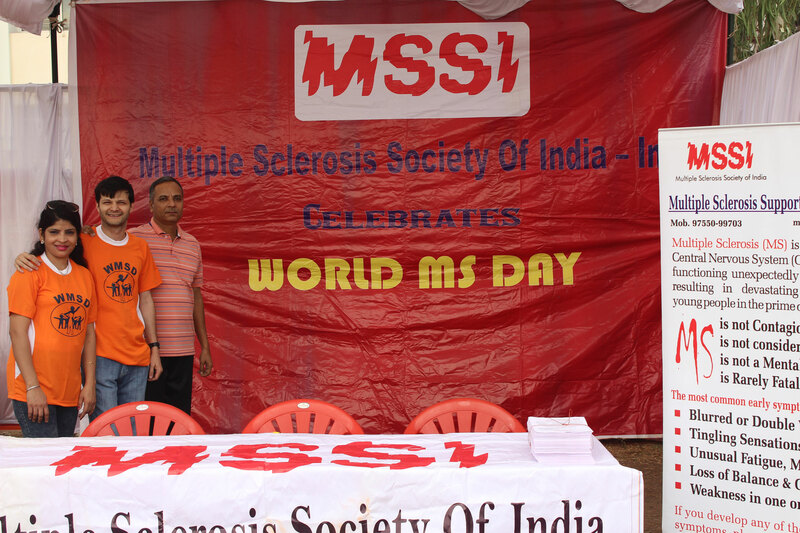 Multiple Sclerosis Society of India, Mumbai Chapter World MS Day (WMSD) Programe. 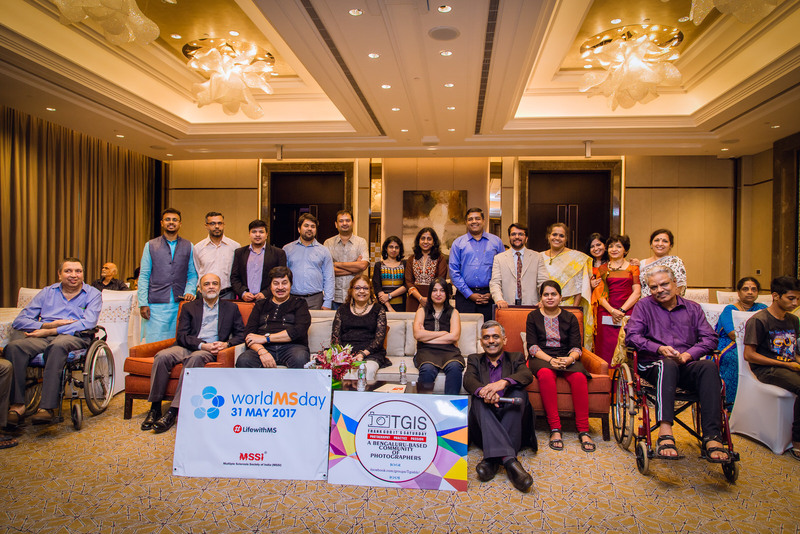 On Sunday 14th May, MSSI Mumbai Chapter, on the occasion of World MS Day 2017, had organized an interesting Seminar on “Wellness in MS” with different Alternative Therapies. It was held from 4.30 to 7.30 pm at SIES School Auditorium, in Matunga. 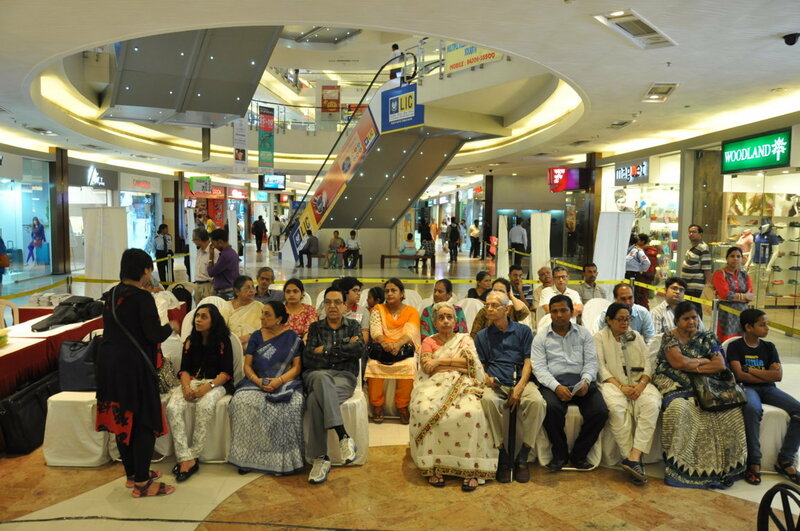 Around 90/100 persons were present including MSPs, Caregivers, Friends, Volunteers & MSSI Team. In MS more importance is given to Allopath treatment but issues related to good health and wellness are often neglected, Today’s program was especially organized for MSPs & caregivers to interact with experts associated with different aspects of Health care in MS . This was divided into 3 sessions. Ms.Dhara Thakkar, MSSI Member, welcomed all present & invited the dignitaries along with Sheela Chitnis & Afsaneh Randeria on stage. The Program started with an invocation prayer by Sneha. We were very happy to welcome our Chief Guest of the program Gurudas Aras. He is the Director, of A.T.E Enterprises Pvt. Ltd. He is B.Text. from Bombay University as a rank holder & M.Text. by research from Bombay University in 1982, Post graduate diploma in “Marketing Management” from Bombay University in 1984. He leads a team of nearly 200 people under him at A.T.E Enterprises. In his inspirational speech he motivated audience & also spoke about his association of many years with MSSI & highly commended MSSI services provided to the MS Families. To appreciate his generous & continuous help to MSSI, we presented him a Memento. In the first session Dr. Girish Nair, Neurologist from Apollo Hospital, emphasized on Nutrition & Diet & right type of Vitamins & Exercise to be included in daily living. He encouraged MSPs to be more active and maintain a healthy lifestyle which will improve the quality of their life. He has trained a thousands of instructors to teach Chair Yoga from his institute. We had invited one of these instructors, Shrikant Barve Guruji. He demonstrated various Pranayams & Mudras. 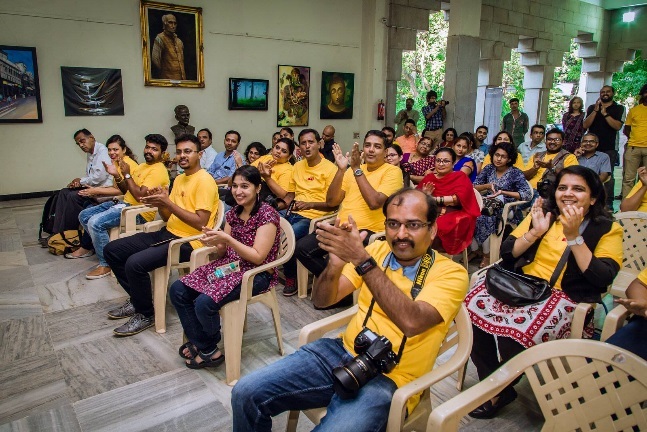 The whole auditorium concentrated on his demonstration and all were involved in performing the pranayams. During the session Shrikantji continued to explain the importance of each Mudra, each pranayam & their benefits on the body if they are regularly practiced. He was presented a trophy at the hands of Dr. Girish Nair. The third session was by Mr. R. Kumar Bhat, a qualified aerobics instructor from National Institute of Aerobic India. He is Currently running his own institute, ‘Aerobic Center’ on personal training. As a wellness professional he was very inspirational & highly motivational. 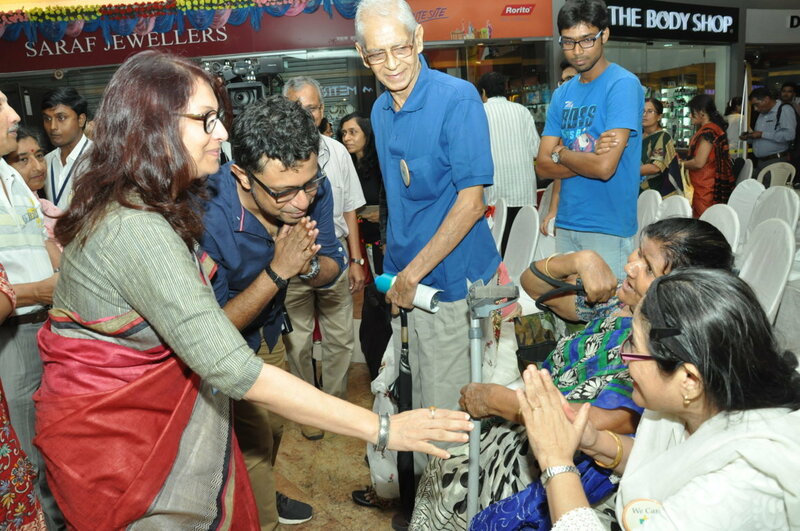 While conducting laughter therapy, he merrily danced on the floor which brought peals of laughter from the audience . 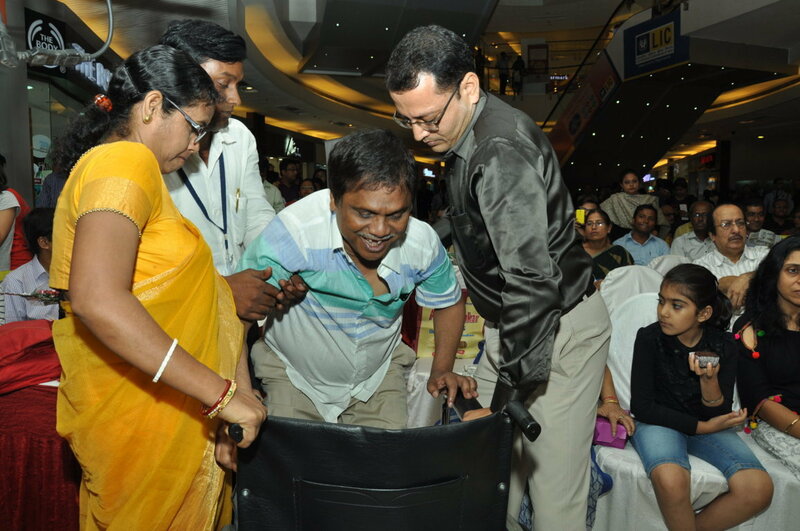 Thus his power packed demonstration was full of energy which completely enthralled the audience. Everyone was responding to him with hearty laughter. His message to all was to enjoy life fully. 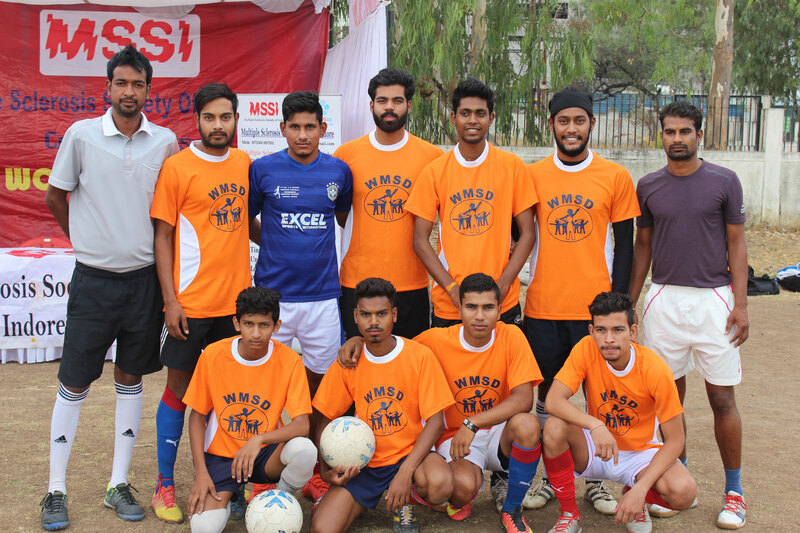 He was presented a trophy at the hands of Ramesh M. Rao, Hon Treasurer of MSSI. All three sessions were excellent & inspiring to all present. Every one left with a smile on their face & with a request to us, to once again invite all the three speakers and organize separate session of each one of them. 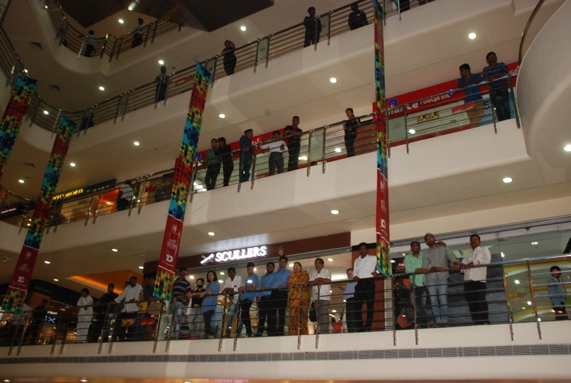 The programme ended with Formation of “Human Chain” by all present. MSSI provided boxes of delicious snacks to all. Conveyance was paid to needy MSPs. Our sincere thanks to : Chief Guest Mr. Aras, Guests Speakers Dr. Girish Nair, Mr. Shrikant Barve & Mr. R Kumar Bhat for spending the evening with us by taking time off from their busy schedule . We thank Dhara Thakkar for Comparing the Program beautifully. 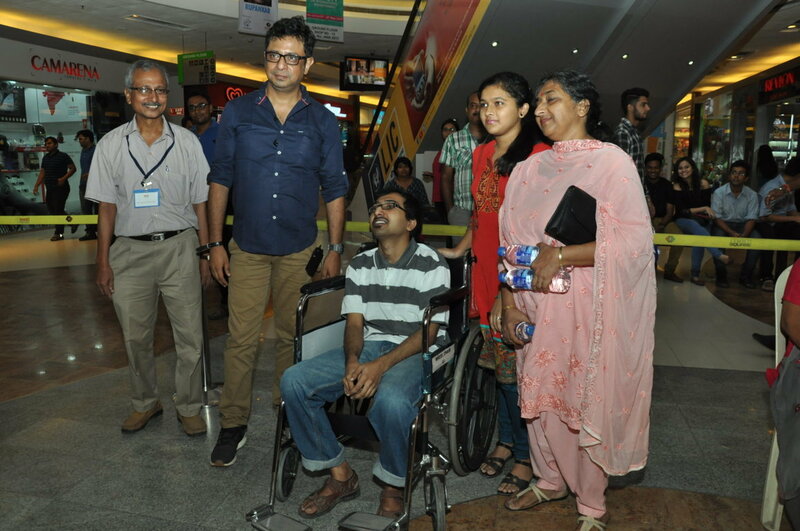 We also thank MS families, well-wishers, donors & MSSI Team. 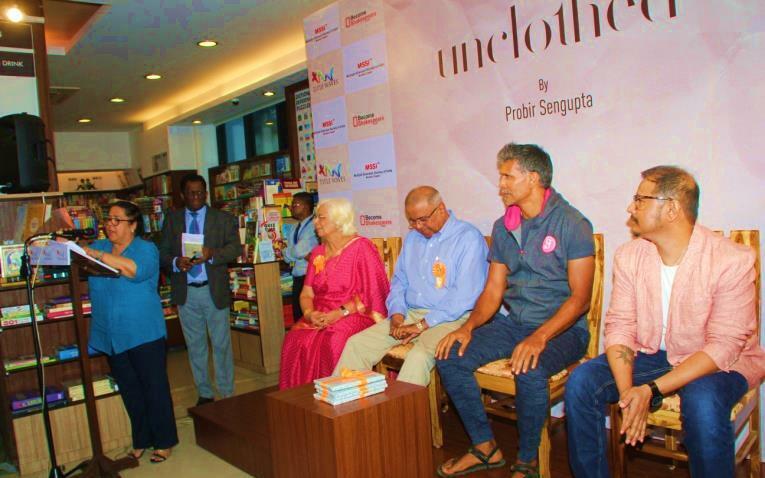 Multiple Sclerosis Society of India (MSSI), Mumbai Chapter on the occasion of World MS day 2017 had organized a mega launch of first Fictionbook ‘Unclothed written by MS patient Probir Sengupta, at the hands of Milind Soman, MSSI Cause Ambassador. 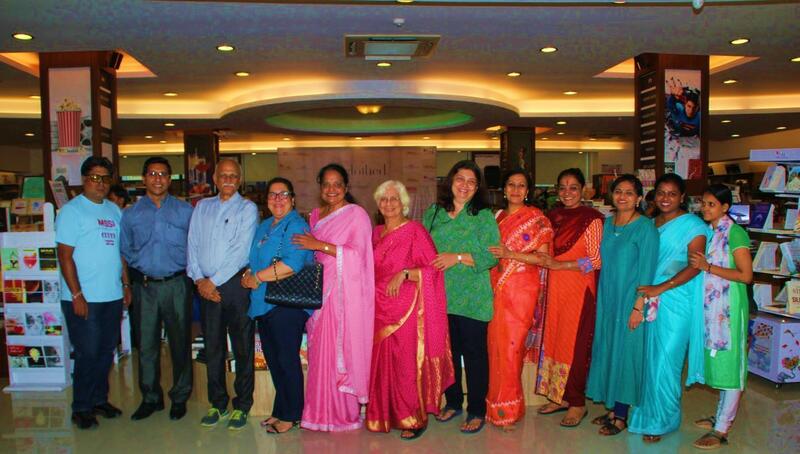 This Event was organized at Title Waves, Bandra on 31st May at 6 pm. 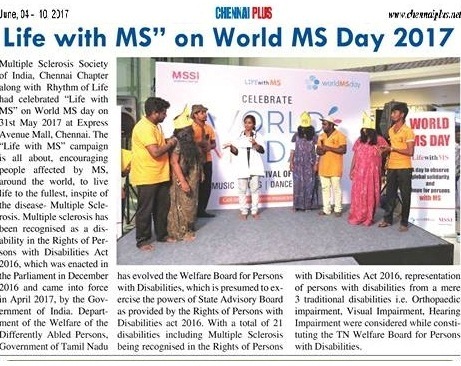 MSSI had published this Event worldwide on MSSI website, Face book & Multiple Sclerosis International Federation website also. On behalf of MSSI, Mrs. Afsaneh Randeria, Joint Honorary Secretary welcomed all & briefly spoke about MS, MSSI and observation of World MS Day. To show the solidarity everybody formed the human chain wherever they were present. We were very honored by the presence of our Chief Guest, Mr. Hemant Nerurkar, former Managing Director, Tata Steel & Milind Soman, Cause Ambassador, MSSI. 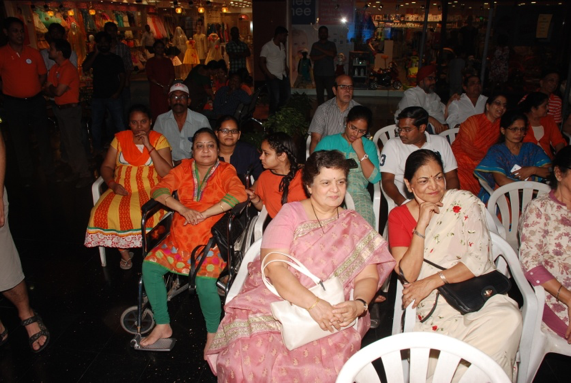 Mrs. Renuka Malaker, National Secretary, MSSI specially came from Delhi to attend the Book Launch. 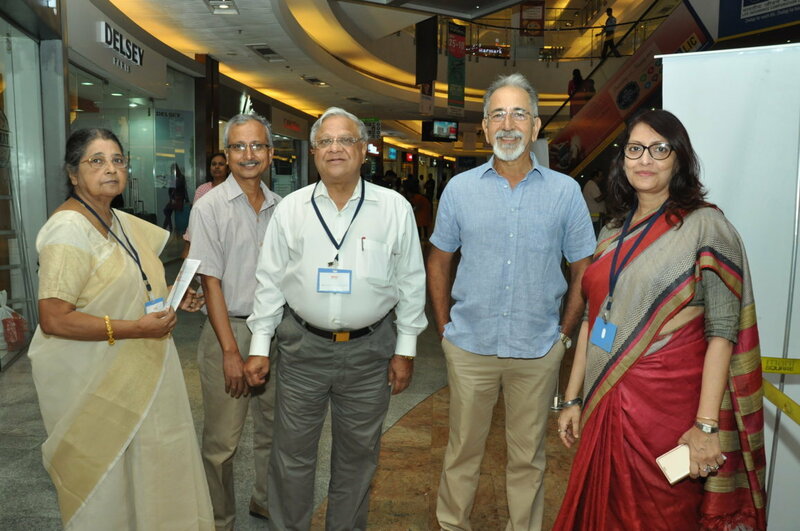 We were very honored by the presence of eminent Neurologist, Dr. Charulata Shankala, from Hinduja Hospital. 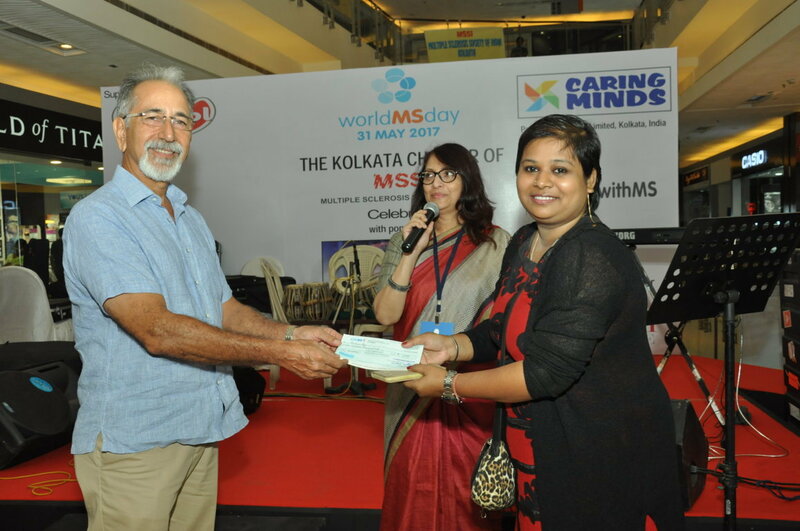 Mr.Nerurkar gave a brief encouraging message for MSSI & on behalf of MSSI, was presented a memento by Mrs. Chitnis. 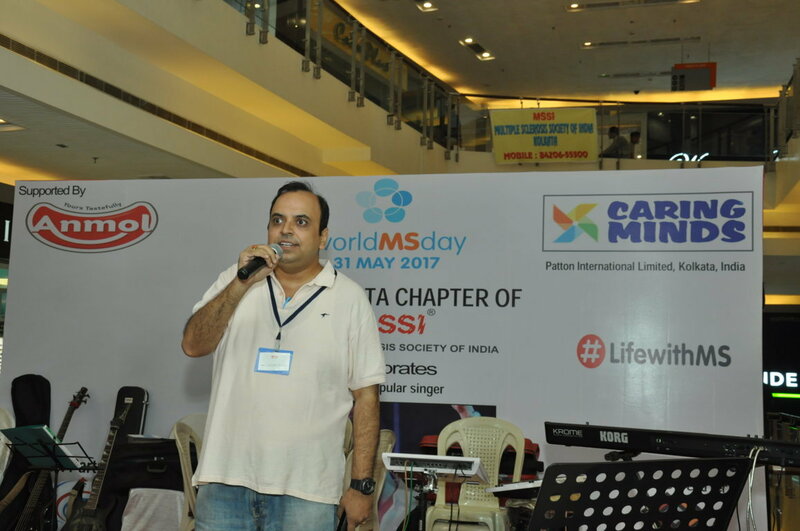 Milind spoke about his long 20 years association with MSSI & encouraged Probir’s initiative as an Author & MS Warrior. 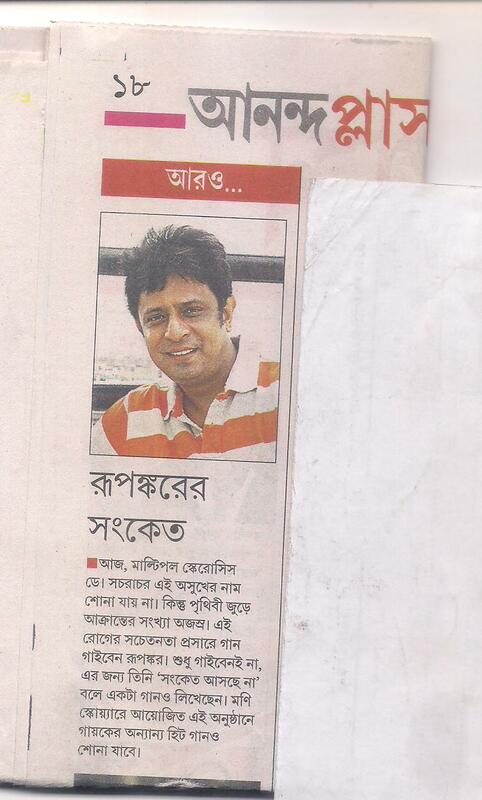 Probir Sengupta had his first MS episode was when he was in his thirties & had an high profile career in advertising. but he had to leave the job due to his MS problems. At home he didn’t sit idle nor lost his creativity & the result is this wonderful book of fiction. 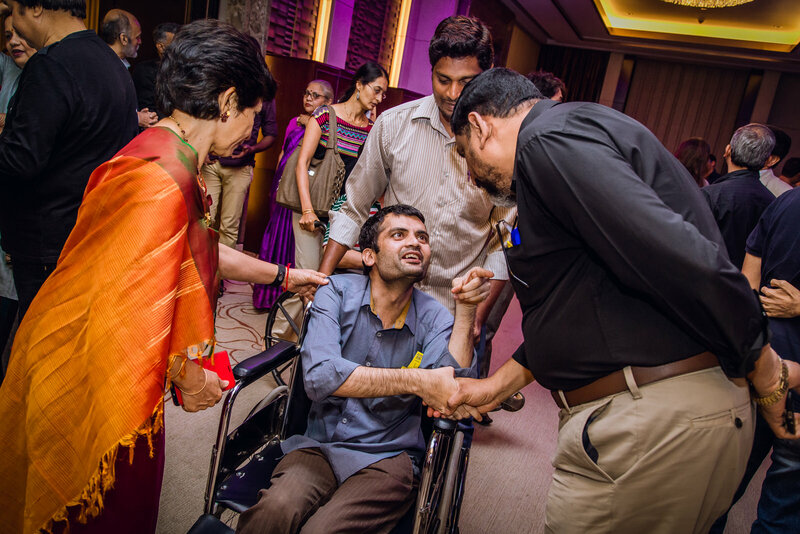 MSSI encouraged his spirits and supported him fully by launching his book worldwide. Today Probir has actually become an inspiration to MS patients. On behalf of MSSI, Both Milind Soman & Probir were presented a memento by Mr. Hemant Nerurkar. The bookstore was filled with the enthusiastic crowd. 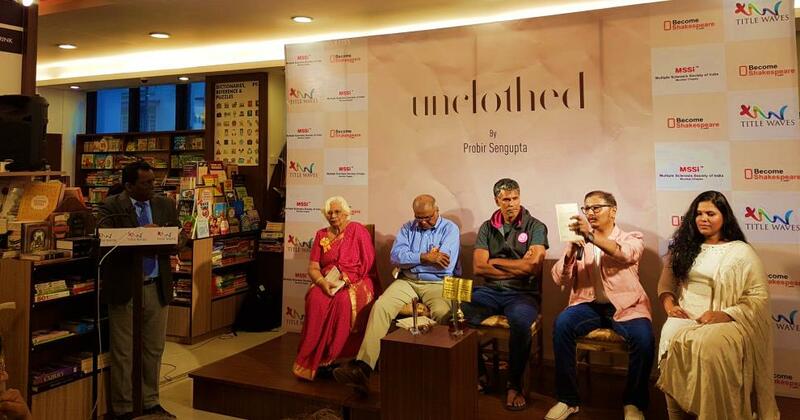 Milind then released the book “Unclothed” & read a Chapter from that book. Malini Nair, head of publishing at BecomeShakespeare.com. briefly shared her experience of publishing Unclothed & working with Probir. 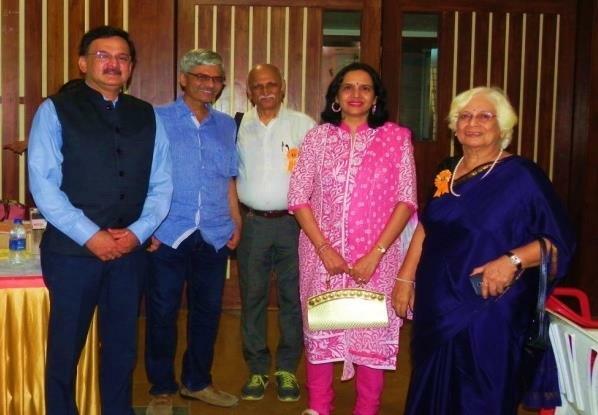 In regards to his writing of the Book, Probir ,very actively participated in an interactive session of Question Answers from the audience.After the panel discussion on the book, the event concluded with a thank-you note from Mrs. Sheela Chitnis, Chairperson, Mumbai Chapter. A MSP Foram Gada, had made a beautiful Card with slogans and all present MSPs signature. It was presented to Probir & he was very happy to receive it. The books were available for purchase at the counter. It was a successful event& it was available live on Probir’s Facebook page. 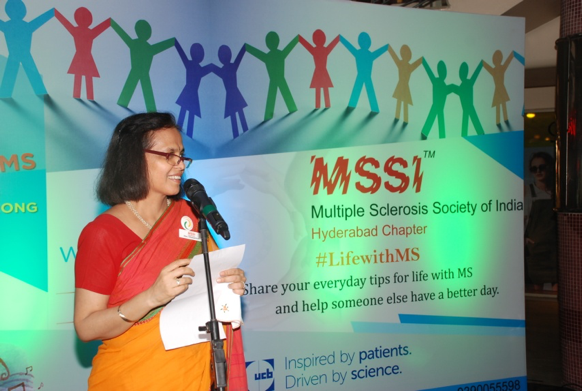 The launch was attended by about 100 people including MS patients & families, Committee Members, Probir’s family & friends, Well-wishers & MSSI Team. Inaugural speech by Mr. Anirban Banerjee, Hony. 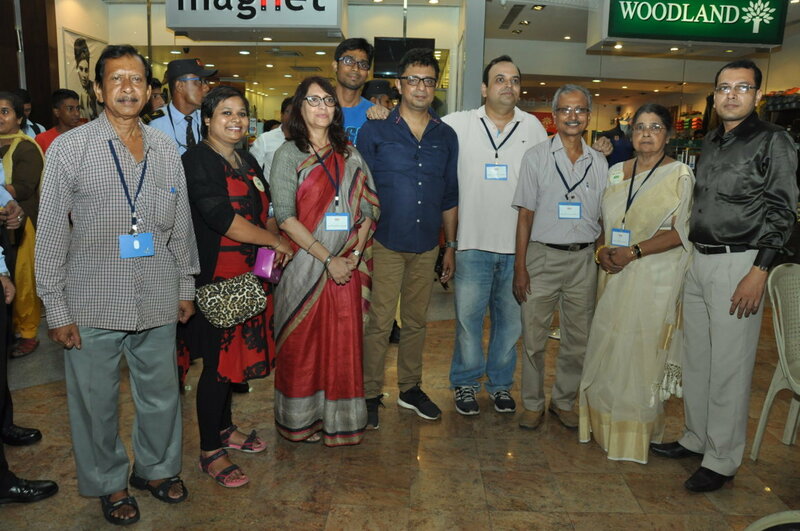 Joint Secretary, Kolkata Chapter. 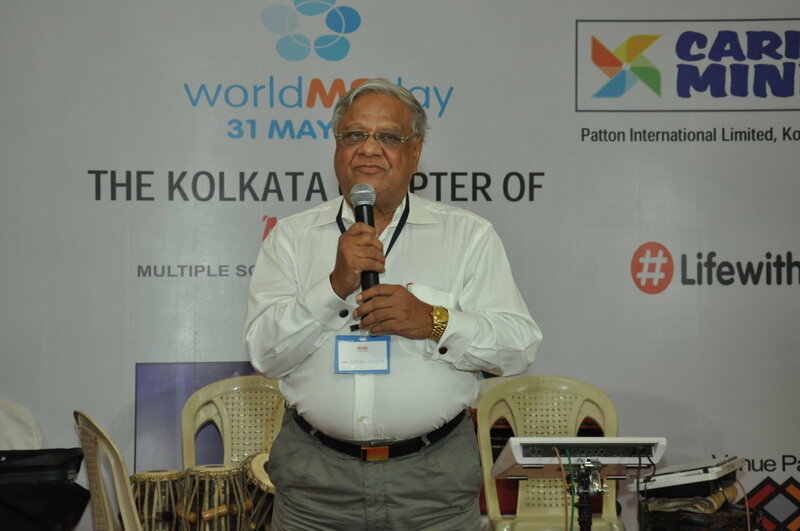 Welcome speech delivered by Mr. Anand Chopra, Hony Chairman, Kolkata Chapter. Guest of honour speech delivered by Mr. Viresh Oberoi, National Chairman, MSSI. Mr. Viresh Oberoi handed over cheque of Rs.15,000/- to our MS friend Rajni Roy towards partial financial support to purchase laptop. 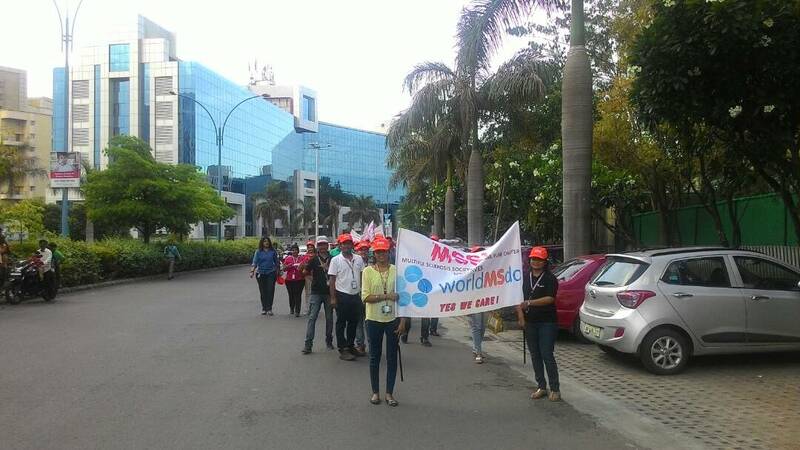 We celebrated World MS Day with great enthusiasm. 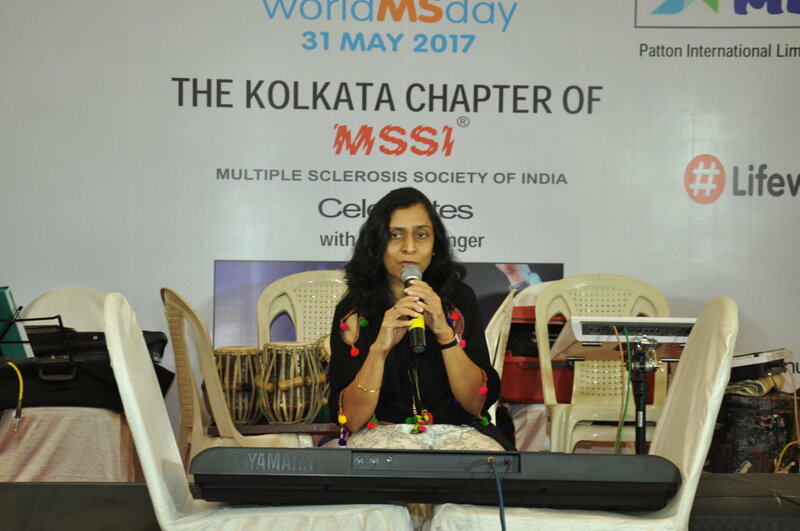 On this day, our MS friends presented their talent, like Mitrajyoti Kushari shown his talent with guitar and songs, Preeti Bery with her synthesizer and Anirban Banerjee with his impromptu songs and seamless anchoring of the entire event! 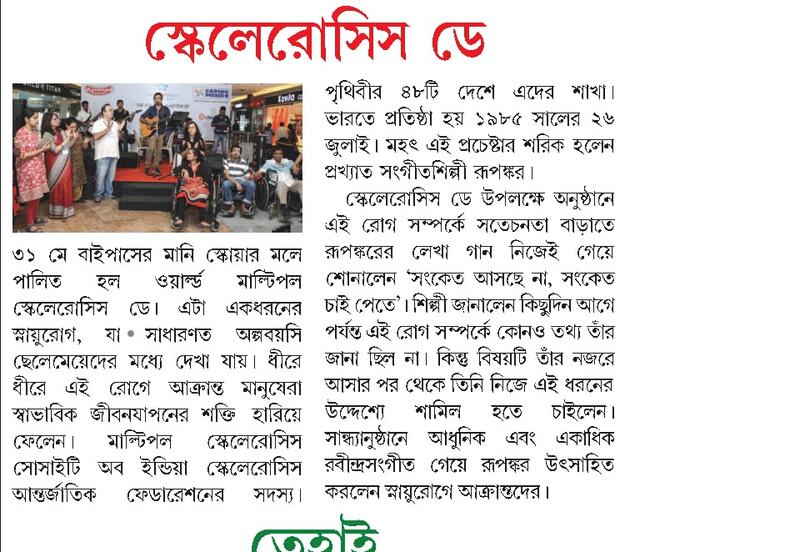 During the event, volunteers of MSSI, Kolkata distributed hundreds of bilingual brochures to all the audiences and the crowd present in Mani Square mall. 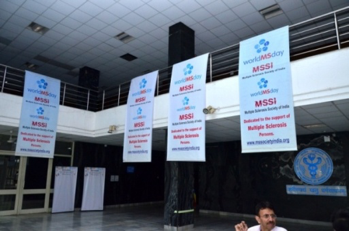 The mall was anyway beautifully decorated with posters and banners of MSSI at several strategic locations. 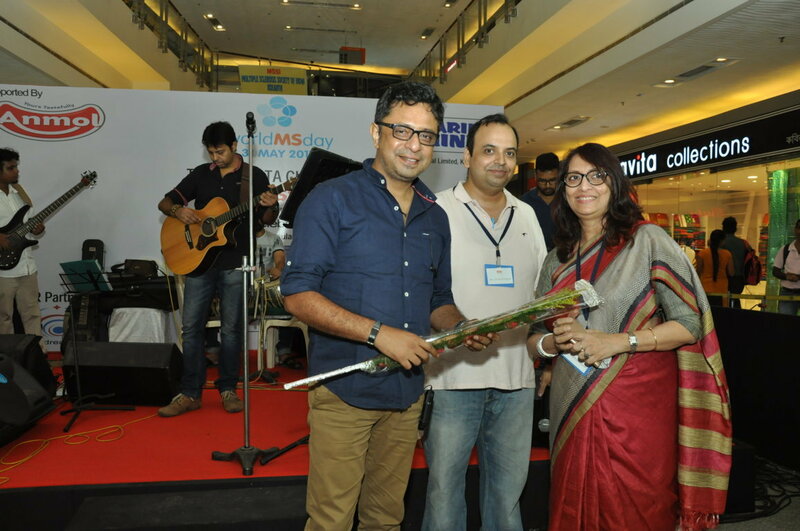 Renowned national award winning singer Rupankar was invited to the stage. He came and sang some of his all popular and hit songs through which the audience was amazed. 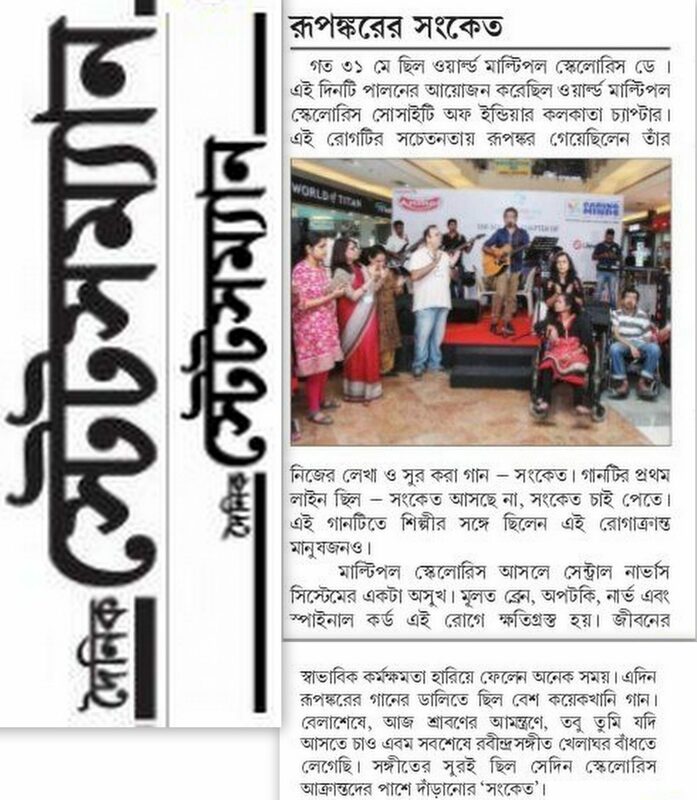 His songs also created lot of attraction in common visitors in the mall. 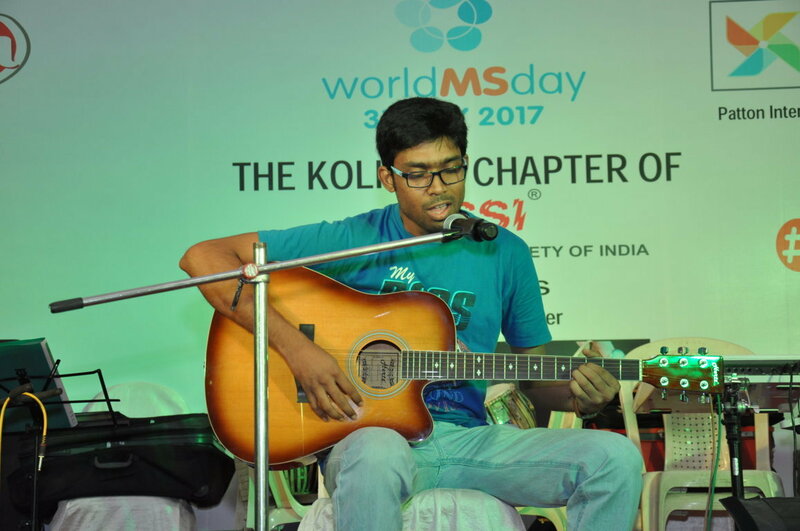 The most attractive part of this session was a song composed by Rupankar especially on the theme of MS and MSP – “Sanket aasche na, sanket chai pete” which drew great energy within the audience. Human chain also was created by the MSPs and volunteers during the song. 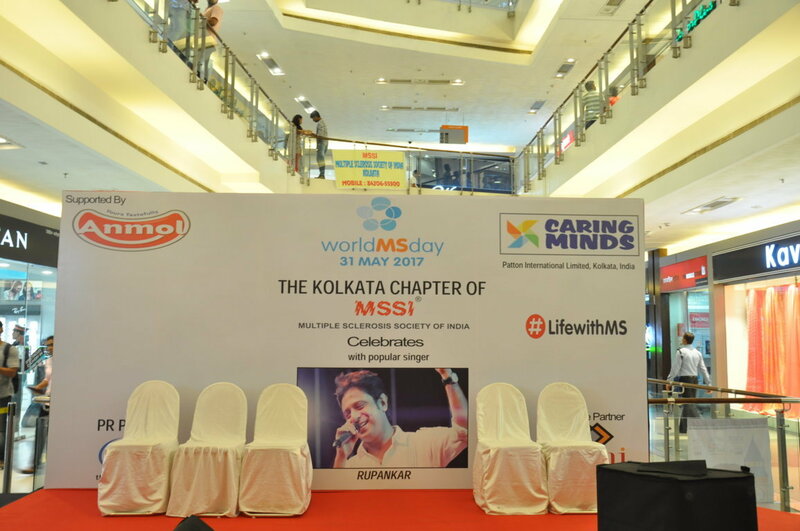 Throughout his performance, he spoke at length on MS, MS friends and the noble work being performed by MSSI, Kolkata. 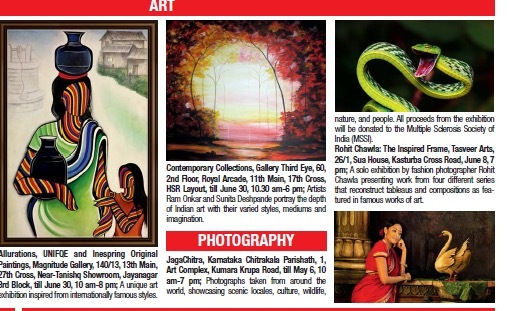 This time we received lot of media coverage through print, online and social media. 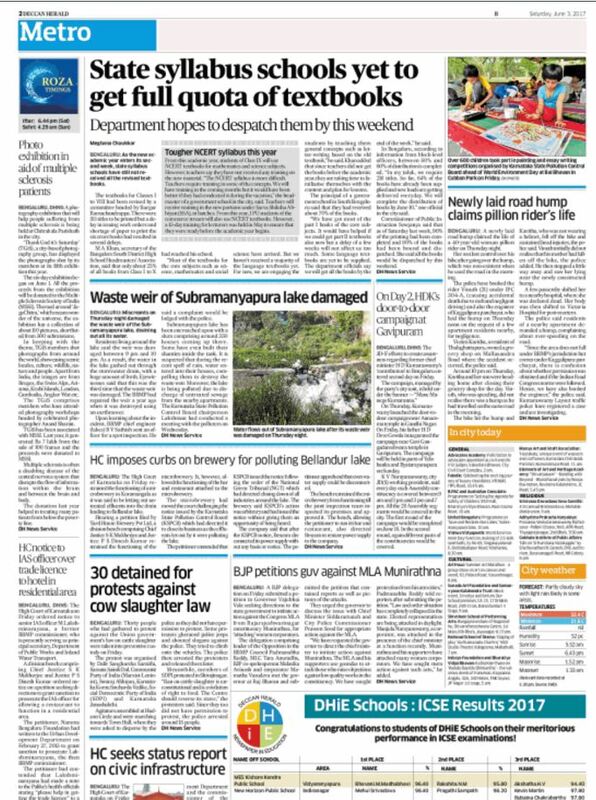 ABP Ananda, Millenium Post, Dainik Statesman, Ei Samay, Sangbad Pratidin, All India Radio to name a few. Light refreshment was served to all. 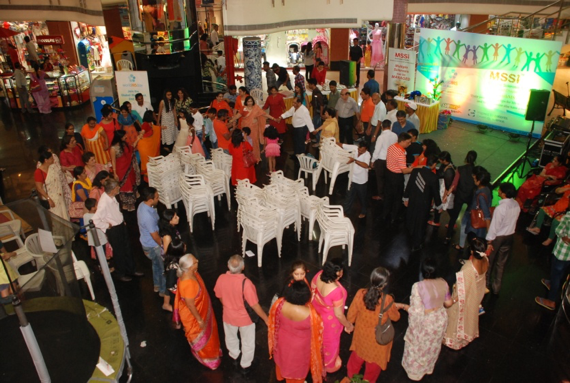 Our special thanks to our venue partner Mani Square Mall, event partner Caring Minds (Patton initiative), Anmol Industries for their financial support to make the event successful. Also our thanks to The Dreamers for arranging media coverage. 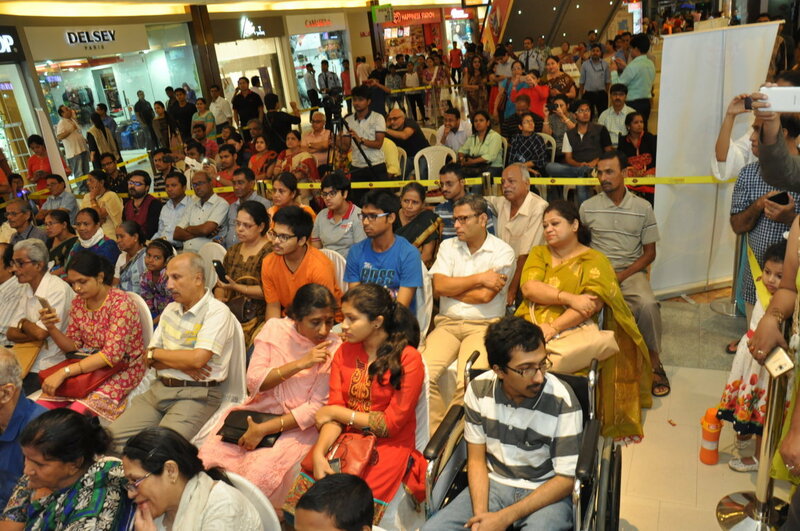 The event was a great success and all the participants and audience enjoyed a lot. 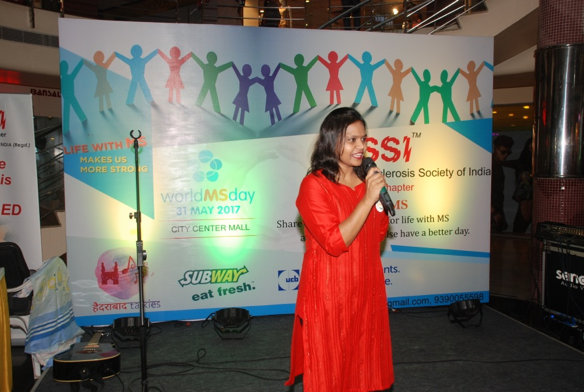 31 May,2017, Kolkata: It was the World Multiple Sclerosis Day observed by the World Multiple Sclerosis Society Of India, Kolkata Chapter at Mani Square Mall, today. 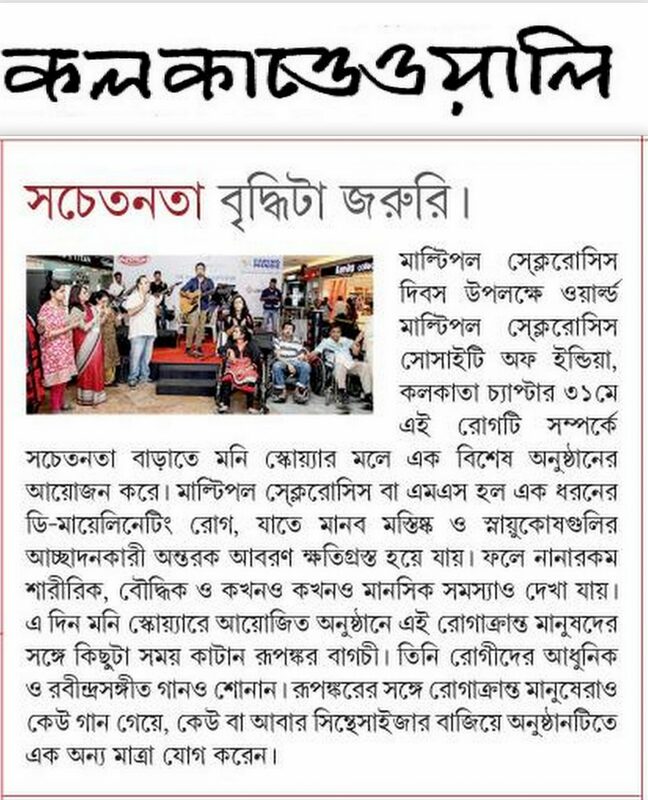 The event was graced by a gala performance by the eminent singer Rupankar who scored a new song “ Sanket Aschhena,Sanket Chai Pete” for the affected people to get more awareness regarding the disease. He performed the song along with affected people. He said, “ I even was not aware of this disease. Whenever I came to know about it I thought I must support the cause through my music. 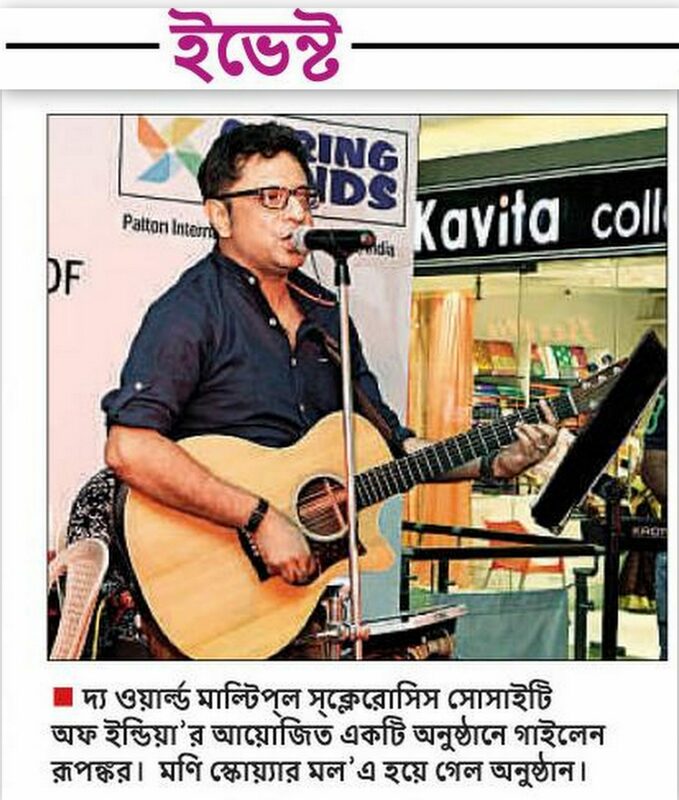 As I got a request to compose a new song for creating awareness I wrote it, composed tune within two days.” Interestingly he fulfilled wish of songs requested by the affected people one after other as Belasheshe, Aaj Shraboner, Tabu Tumi JAdi Aste Chao, followed by Tagore songs like Khelaghar Bandhte Legechhi and so on. Multiple sclerosis (MS) is a serious neurological disorder diagnosed mainly in young adults. MS is a disorder of the central nervous system (CNS). The CNS consists of the brain, optic nerves and spinal cord. 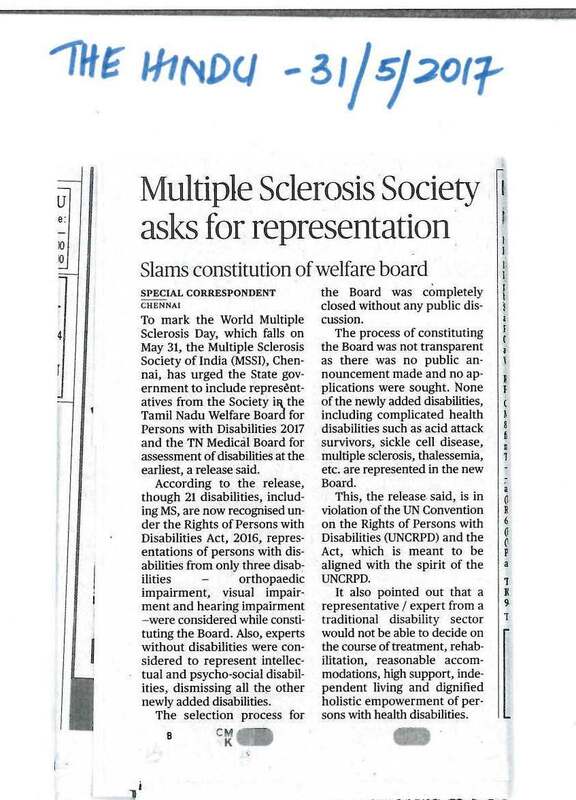 Multiple Sclerosis Society of India (MSSI) is a registered voluntary, non-profit organization.. MSSI works for the welfare of persons affected by Multiple Sclerosis. The Society is a member of the Multiple Sclerosis International Federation (MSIF) based in London, UK. MSSI works in co-operation with 48 other member countries of MSIF, thereby working in collaborating with similar organization all over the world. 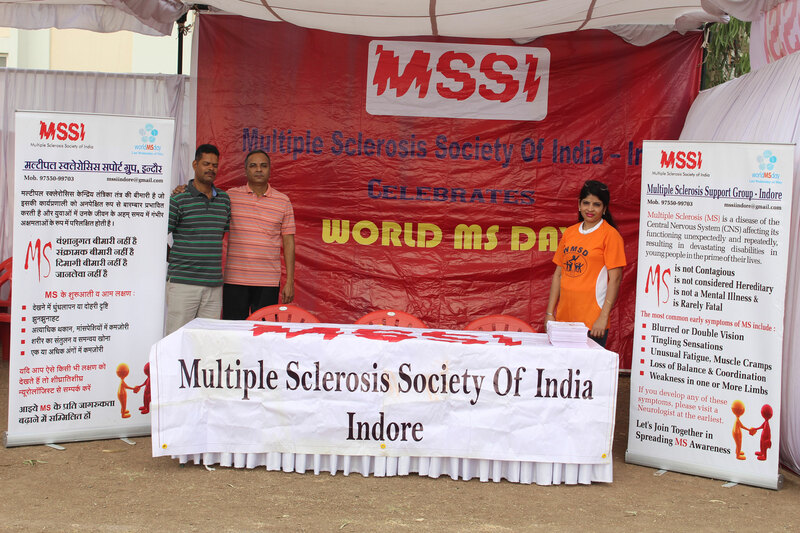 Multiple Sclerosis Society of India was established on July 26, 1985 and is a support group managed by the MSPs (MS Persons) for the MSPs. 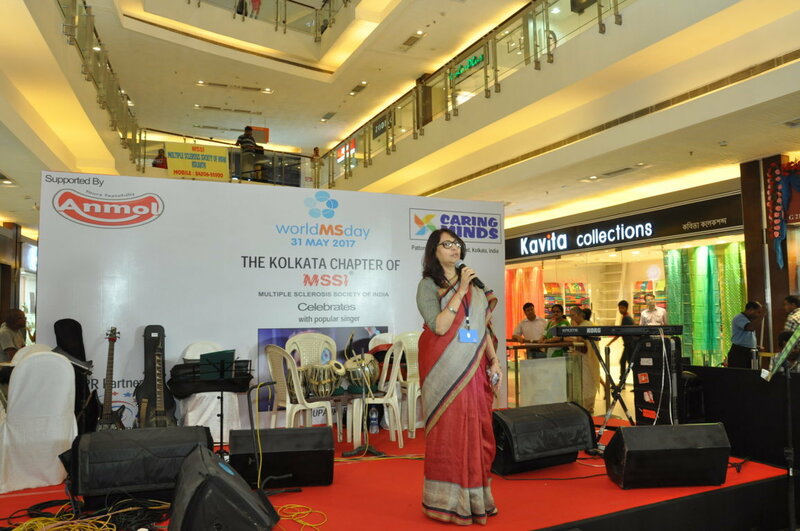 The Kolkata Chapter of MSSI was established on 23 July, 1990with the initiative of Mr.Tobaccowala, the then chairman of Voltas Ltd, along with Mrs. Sheila Chitnis and Mrs. R.S. Fazalbhoy, an eminent social worker. The Chapter was registered on 16 September, 1992. Mr.RusiGimi was our first Chairman and Mrs.ZarinGimi, his wife was our chief patron. Our 20 years of existence is crowded with many events. 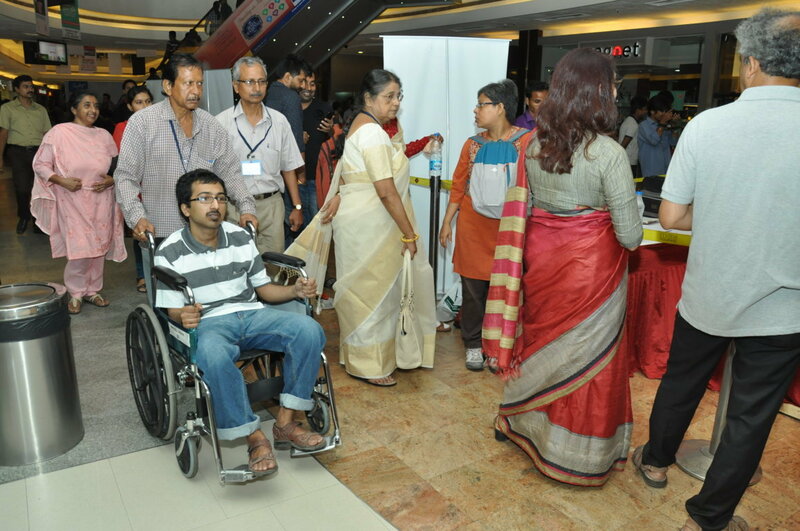 Now we are dealing with 200 MS patients in Kolkata and adjacent areas who are registered with MSSI, Kolkata. But the actual numbers are assumed to be far more. We postponed the WMSD from 31st May to 2nd June 2017. Just as well. We were over the hottest month of the year and encountered a cloudier and cooler climate. We assembled at 5.00 pm at Tower No. 6, Magarpatta City and were happy to be greeted by more than 150 plus volunteers from BNY Mellon. We started by distributing our hallmark orange caps to all the participants. 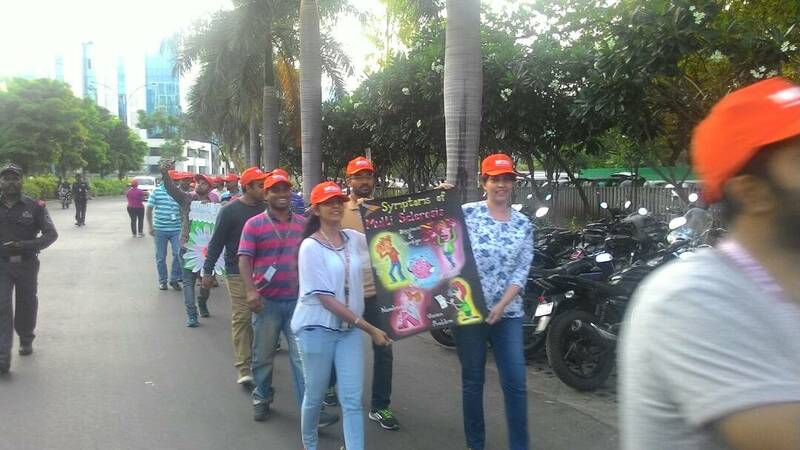 Some of them were carrying beautiful hand painted posters illustrating what multiple sclerosis is and what it does to persons who bear this burden. Despite stressing what MS is about, the posters had an upbeat, bright and cheerful side to them because they were done in a semi-cartoon style. A hell of a lot of work must have gone into making the posters but the volunteers DID IT FOR US. Hozannahs to all the enthusiastic volunteers! As there were a lot of new volunteers this year, Shanice Fernandes of BNY Mellon gave a brief talk about what MS is, how it attacks youngsters when they are raring to go and meet life head on, how medicine has so far been a matter of alleviation and a possible arrest in the progress of the ailment, etc. However, she concluded on a happy note about the giant strides made by medicine towards finding a cure for the disease. 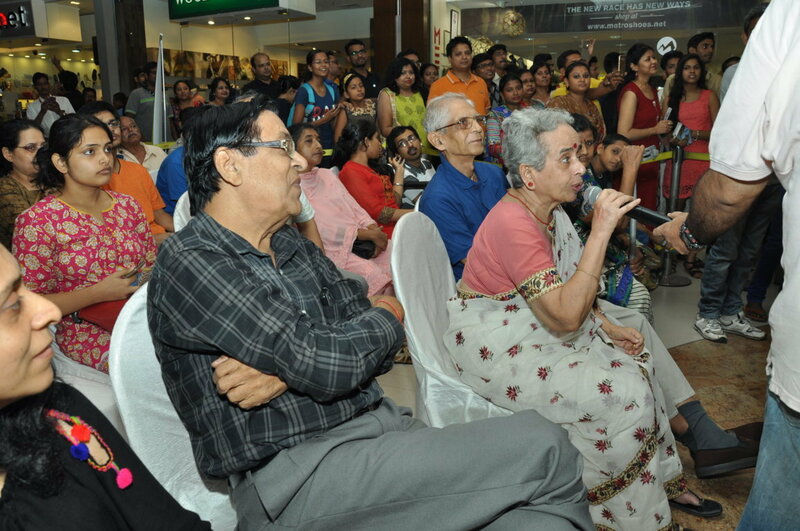 Happy to say that the youngsters were listening attentively to the talk. 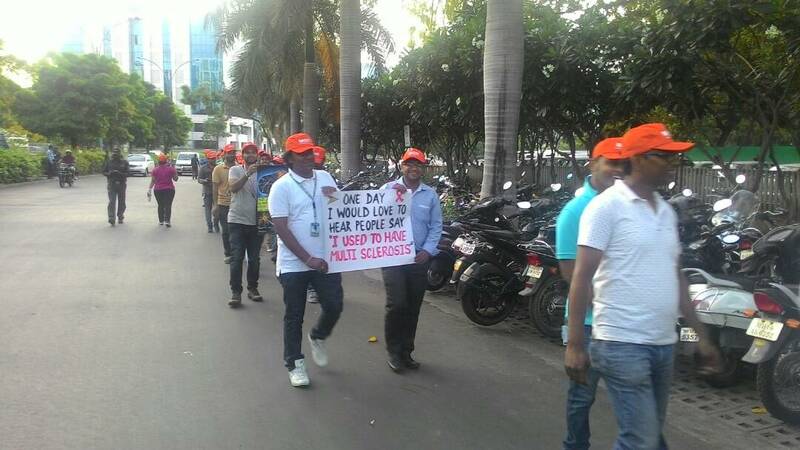 Next, we formed a huge column of people holding banners, posters and a white flag with MSSI emblazoned on it in orange. Traffic was automatically stopped on both sides and people seemed to be quite interested in the banners we were carrying and the slogan of YES WE CARE that we were belting out. We took a long walk around Aditi Garden aAnd came back to Tower 6, a walk of around 15 minutes. All the participants were then treated to a welcome cool drink of Lemon Lassi which had been procured from ABC Farms through the good offices of Mrs. Mini Grant. Before dispersing we had a group photo session where all of us threw our orange caps into the air in sheer jubilation. Some photographs of the event are attached to this report. 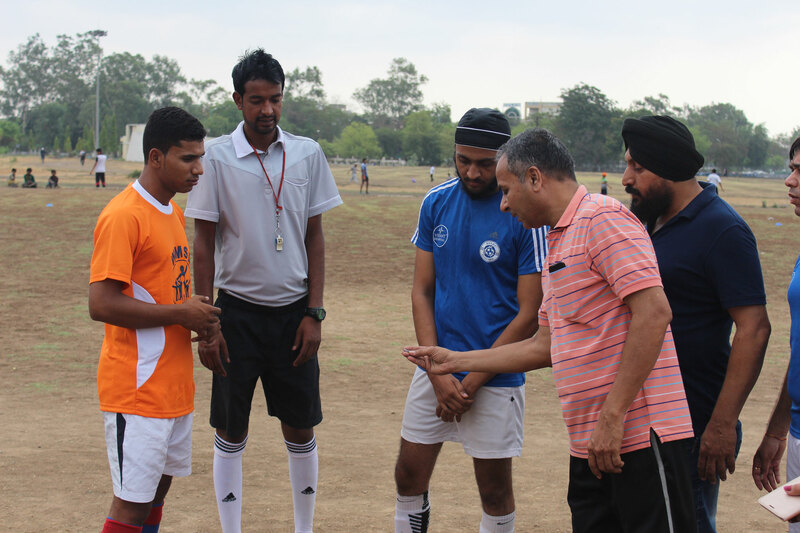 We celebrated WMSD by hosting a friendly football match at D.A.V.V. University, Football ground, Khandwa road, Indore on 28 January 2017, Sunday from 7.30 am to 10.30 am. 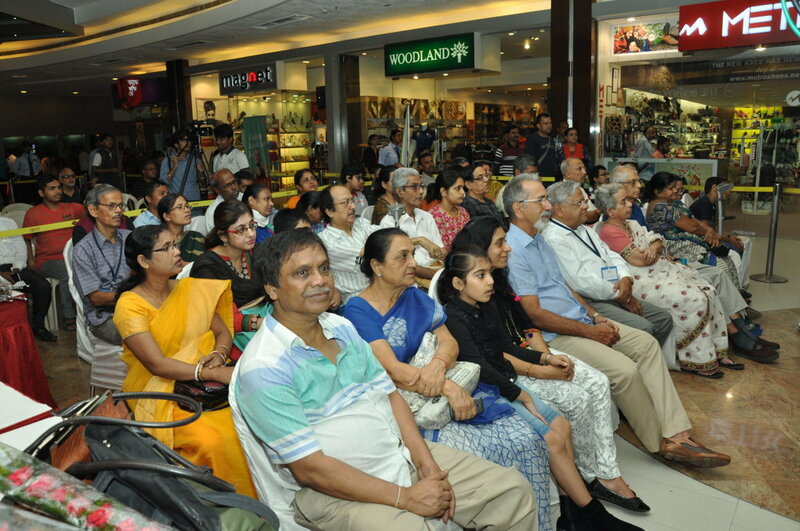 Around 50 people were present at the event. 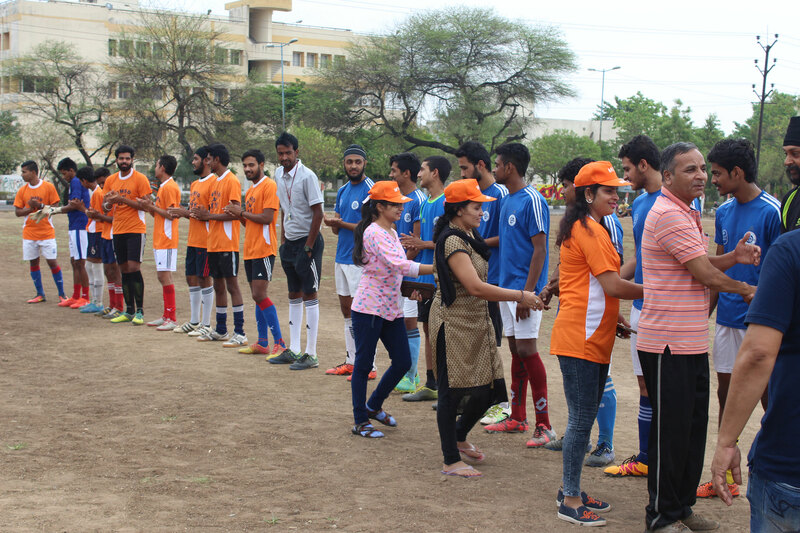 The match was played between Orange and Blue team, each comprising of 11 players for 45 minutes. The Orange team was from the Sporting Union Football Club and the Blue team was from DAVV Football Club. Eventually the Orange team won over the Blue team with goal 1-0 score. After the match mementos were distributed to all the players, refree and coaches by our chairperson, Dr. Manish Bandhisthey. Finally, the WMSD event ended with typical Indori refreshments (Poha and Jalebi). 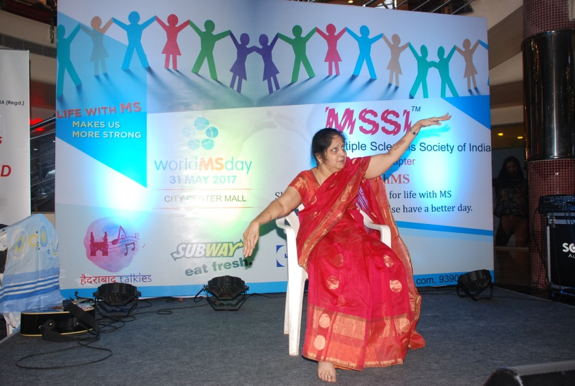 The Hyderabad Chapter celebrated World MS Day at City Center Mall, Banjara Hills on 31/5/2017 with the theme ‘Life with MS’. The colour for the day was Orange. 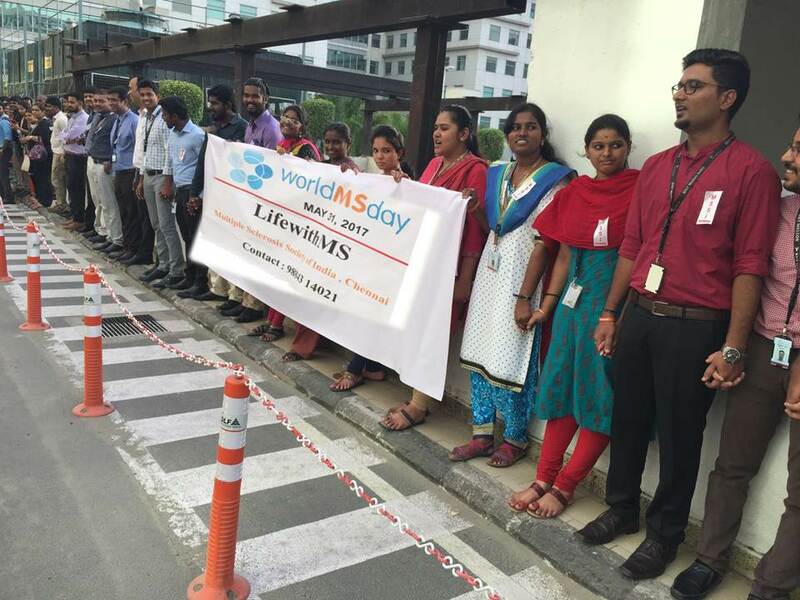 80 Members and guests joined hands to form the Human Chain for World MS Day that included PwMS, their family members, caregivers, guests and life members. 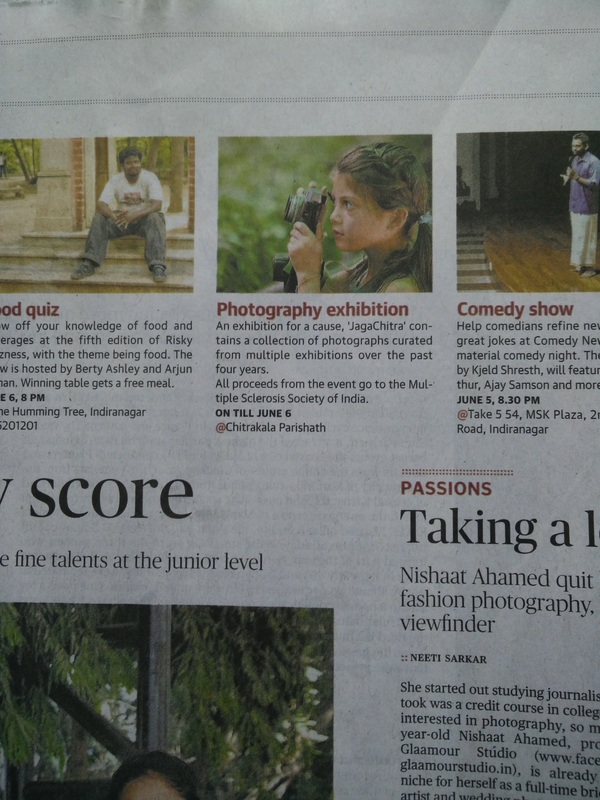 The enthusiastic participation (despite the scorching summer heat) by everyone made this event a ‘SUCCESS’. The event timing was from 5.00 PM till 7.00 PM. However, like all other events, the participants enjoyed themselves and thus it got extended till 7.30 PM (not breaking the tradition). 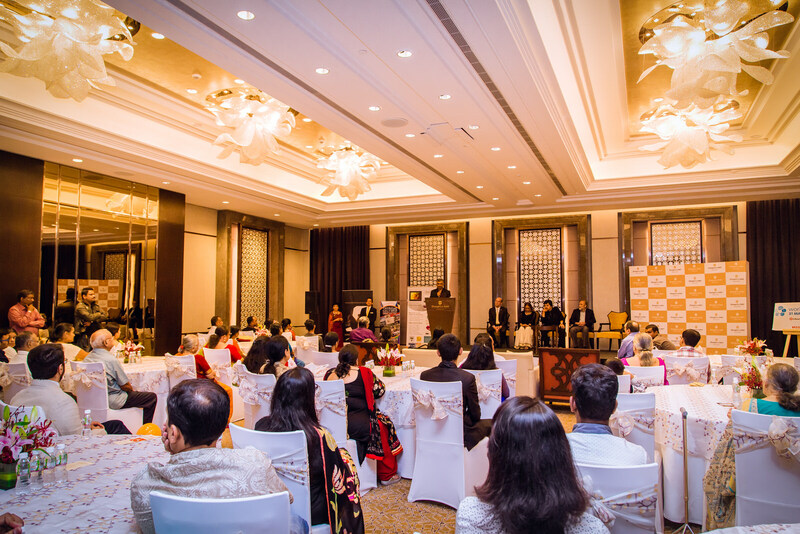 Our event began with a welcome address by Mrs. Mamta Gupta – Chapter Chairperson. 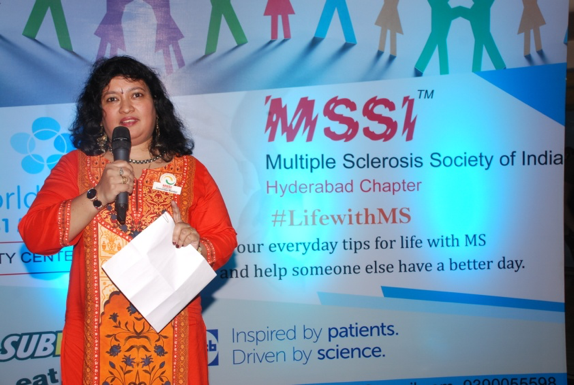 She welcomed all the participants and shared details about the importance of World MS Day and Hyderabad Chapter’s social responsible services to society. 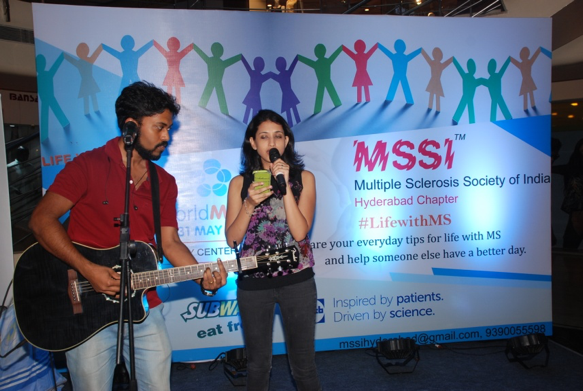 Rebecca, PwMS began the program with her soulful rendering of the famous song “Heal the World” followed by another song “Saari umr hum” from the movie 3 Idiots. She shared her own experiences and of a few other MS persons through her verse “Life with MS” and the audience was visibly moved by her story. Arti Mittal, PwMS recited a poem “Life is Beautiful” (penned by her). 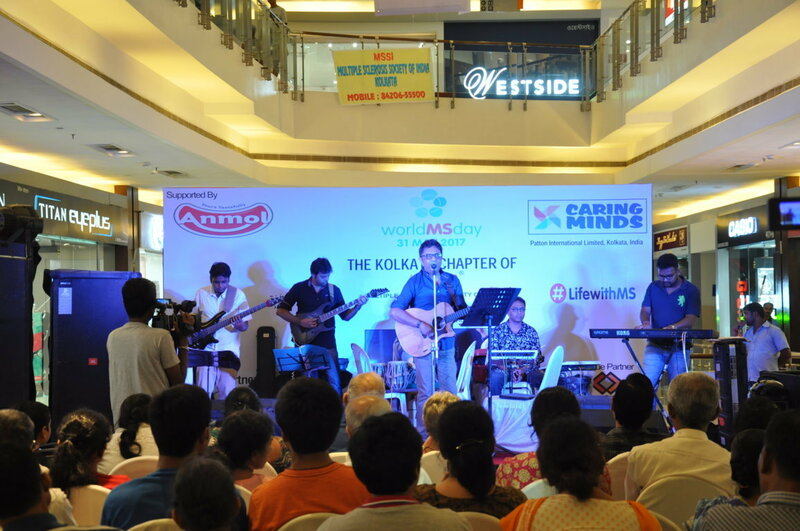 Master Gaurav Mittal, PwMS Mrs. Arti Mittal’s son sang his own composition “Monster”. Miss Akshara (whom we all call Baby Doll), daughter of PwMS Mrs. Srikanya gave a rousing dance performance to the song “Nachange Saari Raat”. 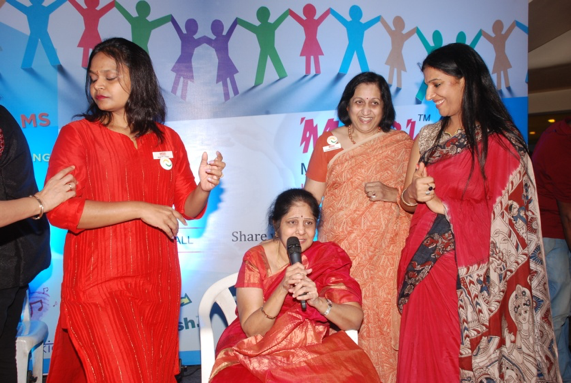 Niharika Bohra, daughter of PwMS Mrs. Suman Bohra sang the beautiful song “Aashayen”. 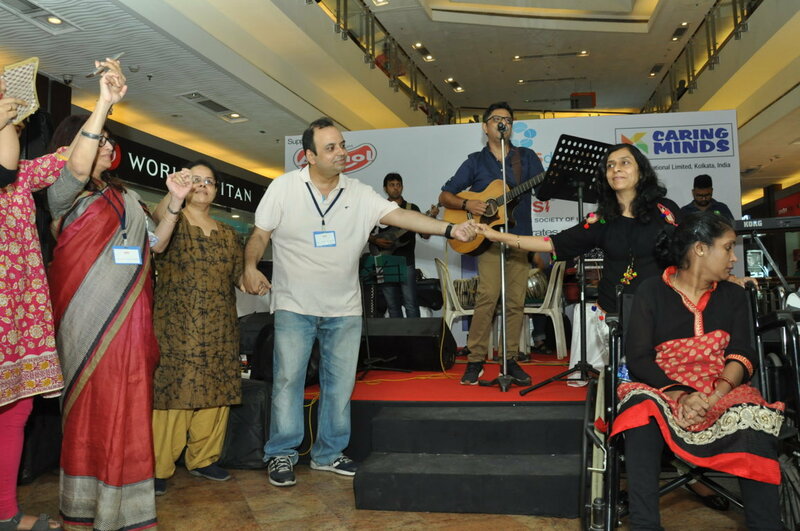 Ramadevi, PwMS who is currently confined to a wheelchair displayed the true spirit of ‘Life with MS’ by performing to the song “Nadavinodam” while sitting on a chair. This was the highlight of the evening. 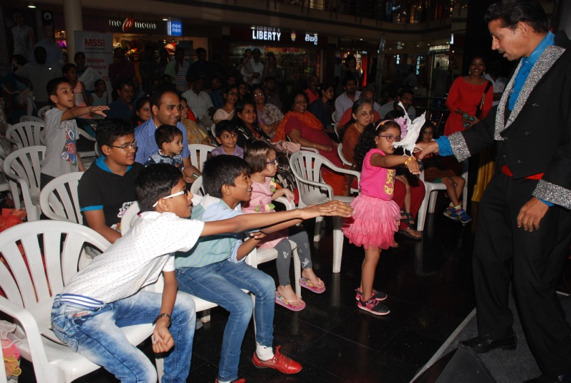 P. Murali Krishna (Guinness record holder) and award winning magician entertained the audience with his magic acts. Dance performance while sitting on a chair by Rama Devi, PwMS. She is wheelchair bound. The MSSI Hyderabad Chapter expresses their sincere gratitude to our wonderful sponsors without whom, this event would not have been possible. 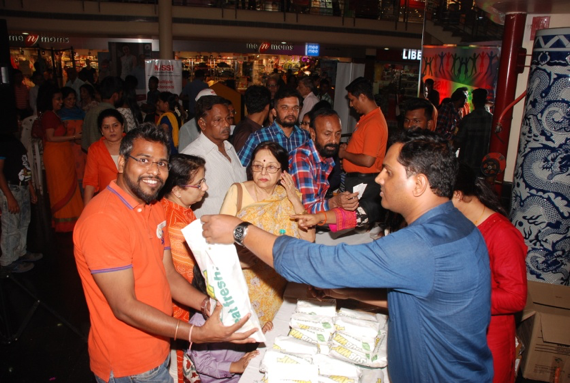 We gratefully acknowledge Mr. Sandeep Shah of Subway for the generosity in providing snacks and refreshments for all the event attendees. We are very thankful to UCB India for their support towards this event. We express our gratitude to Mr. Asim of City Center Mall, Banjara Hills in Hyderabad for graciously providing the venue to host our event. Special thanks to the vendor, Mrs. Deepthi of Darsh Events for providing the backdrop, and organising the stage and sound. 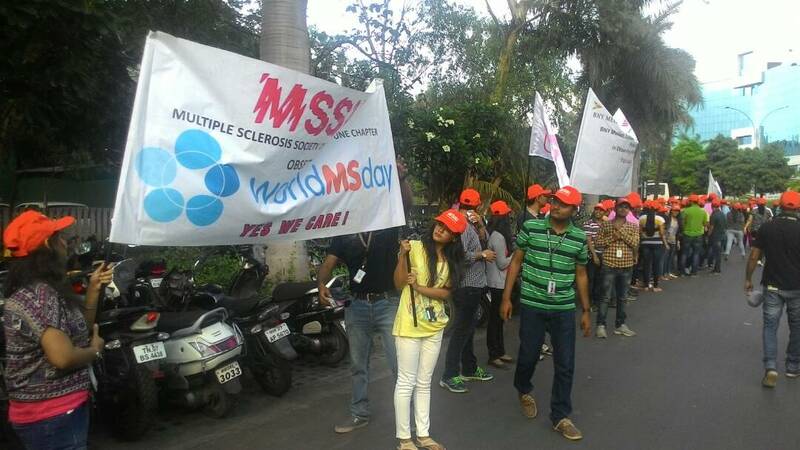 World MS Day is a global event World MS Day is officially marked on the last Wednesday of May of the current year. 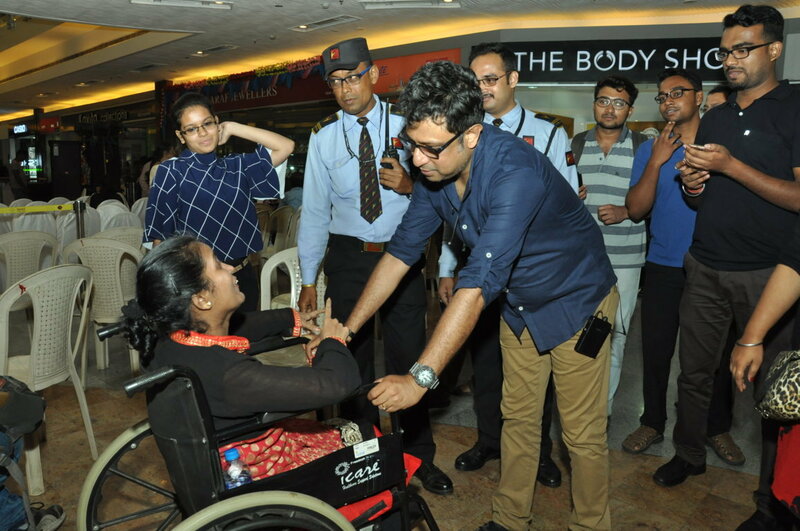 Events and campaigns take place throughout the month of May under the guidance of MULTIPLE SCLEROSIS INTERNATIONAL FEDERATION, MSIF all over the world i.e.in 78 countries. 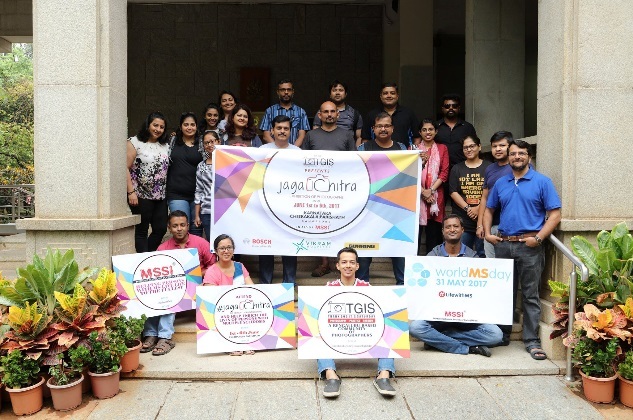 This helps to bring the global MS community together to share their stories, raise awareness and campaign with and for everyone affected by Multiple Sclerosis, MS. Together we reach out to hundreds of thousands of people around the world, with a campaign focusing on a different theme each year. 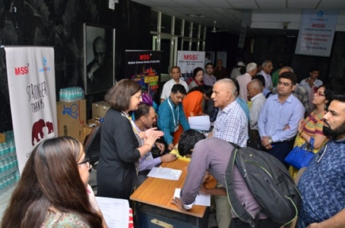 To commemorate World MS Day, this year the most prestigious Hospital and Research Centre AIIMS, New Delhi in collaboration with MULTIPLE SCLEROSIS SOCIETY OF INDIA DELHI organized a PRESS CONFERENCE at their new Convergence Block, Media Room and a medical panel discussion & information on the latest treatment AHSCT for MS and how to lead and manage LIFE WITH MS at JAWAHARLAL NEHRU AUDITORIUM. 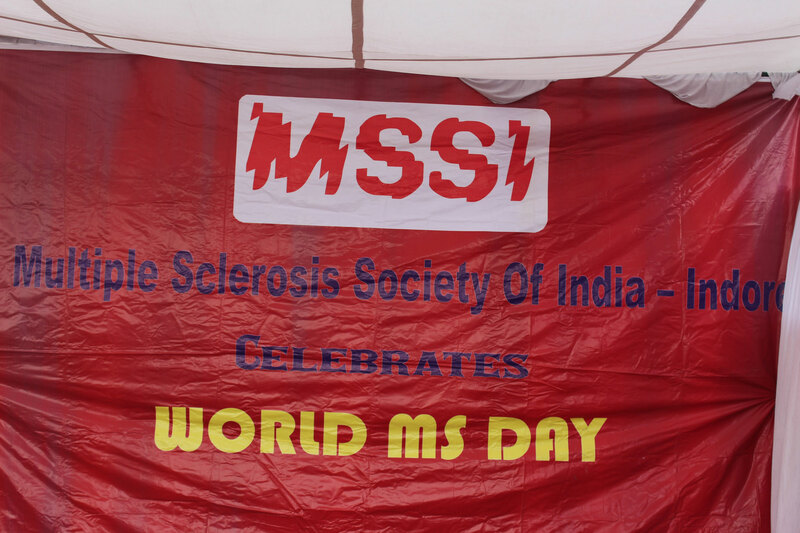 All the MSSI Delhi MS Patients, members, volunteers and concerned people were invited. The session was open to public. 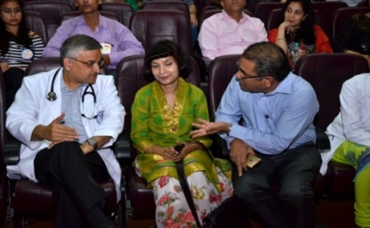 The seminar was Hosted by AIIMS and Chaired by Dr. R Guleria, Director of AIIMS. 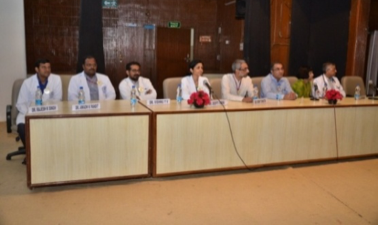 Moderator was Dr Kameshwar Prasad, HOD, Department of Neurology, AIIMS and participant panel doctors were Dr Padma Srivastava, Dr Vinay Goyal , Dr.Rohit Bhatia,Dr Deepti Vibha ,Dr Vishnu YV, Dr Rajesh Singh and Dr Awadh Pandit. 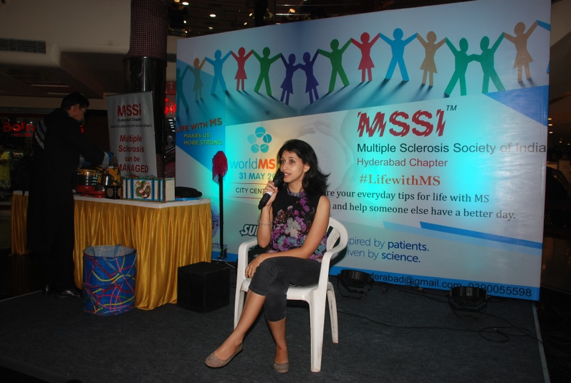 It was an open forum for questions from each MS patients & answered to their satisfaction. Each Doctor was allotted different topics. The topics which were touched: – LATEST MEDICAL ADVANCES IN MS, AHSCT STEM CELL TREATMENT, BLADDER PROBLEM, WEAKNESS, WALKING DIFFICULTIES, DEPRESSION & TREATMENT, and PREGNANCY & MS & DIET COUNSELING etc. The theme was “LIVING WITH MS”. MSSI Hon. 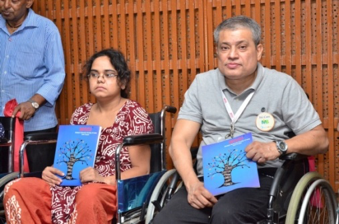 Secretary MSP PRABAL MALAKER inaugurated NEW MSSI BROCHURE FOR WMSD AND Ms.Meenakshi Bhujwala introduced the work of MSSI. 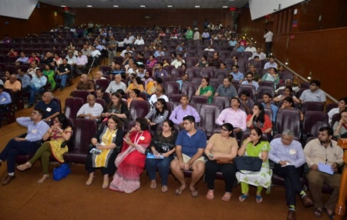 Some Doctors and MSSI members Bipasha Gupta and Meenakshi Bhujwala counseled the MSPs even after the session was over . 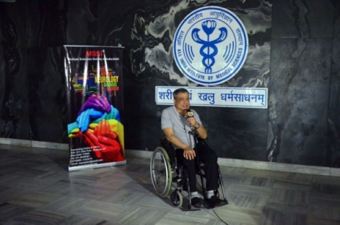 A PRESS CONFERENCE WAS HELD AND EXTENSIVE INTERVIEWS ON AIR FM CHANNELS AND DOORDARSHAN WERE GIVEN BY BIPASHA GUPTA,DR.VINAY GOYAL OF AIIMS AND PRABAL MALAKER PRIOR TO THE EVENT. 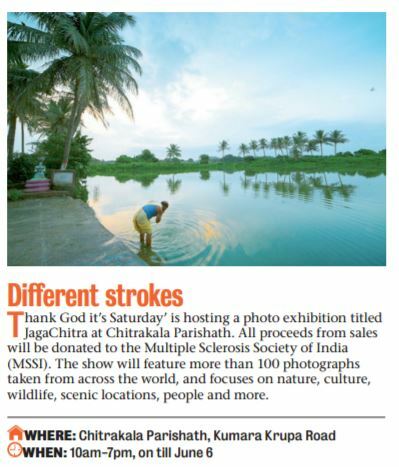 4 LEADING NEWS PAPERS CARRIED QUARTER PAGE PUBLIC NOTICES FOR THIS MULTIPLE SCLEROSIS SEMINAR ON THEIR FRONT PAGE. A large gathering took place in spite of the very hot weather. 30 new patients were identified & enrolled during the Seminar. The Seminar was very interesting and gave all the opportunity to learn many new issues in regards to health safety for MS patients. The question answer session was very good and solved many queries- this was greatly appreciated by all present. 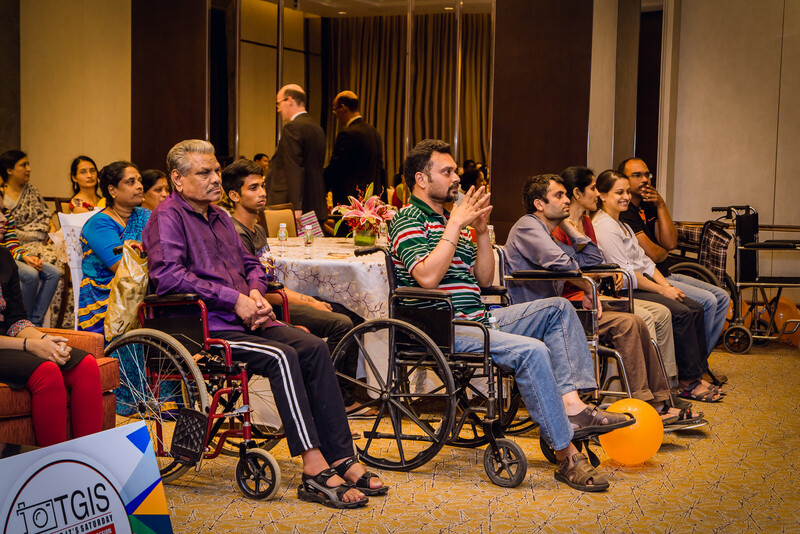 It was a very enriching experience for all MSPs & caregivers who attended the seminar. 9 Doctors of AIIMS, many MSPs with their caregivers, 5 physiotherapists, EC members, volunteers & Office Staff attended this enlightening & stimulating seminar. 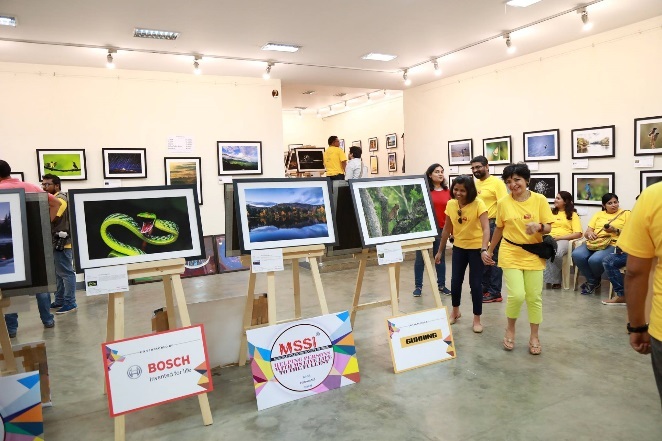 MSSI is grateful to all their members and volunteers for contributing their valuable time . 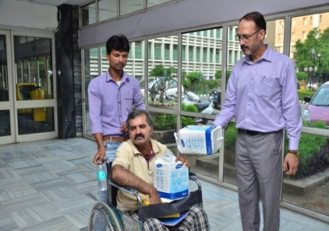 FOOD PACKETS, MEDICINES, WATER BOTTLES, JUICE AND MSSI BROCHURES WERE DISTRIBUTED TO ALL THE MSPS AND CAREGIVERS. 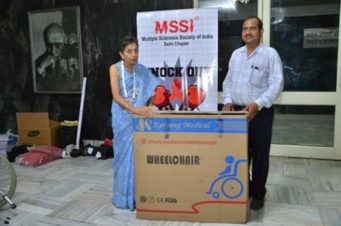 MSSI DELHI DONATED A WHEEL CHAIR AND DIAPERS ON THE DAY TO HELP MSPS. WE ARE OBLIGED TO TATA POWER DDL FOR PROVIDING CARS FOR OUR HOME BOUND NEEDY PATIENTS.